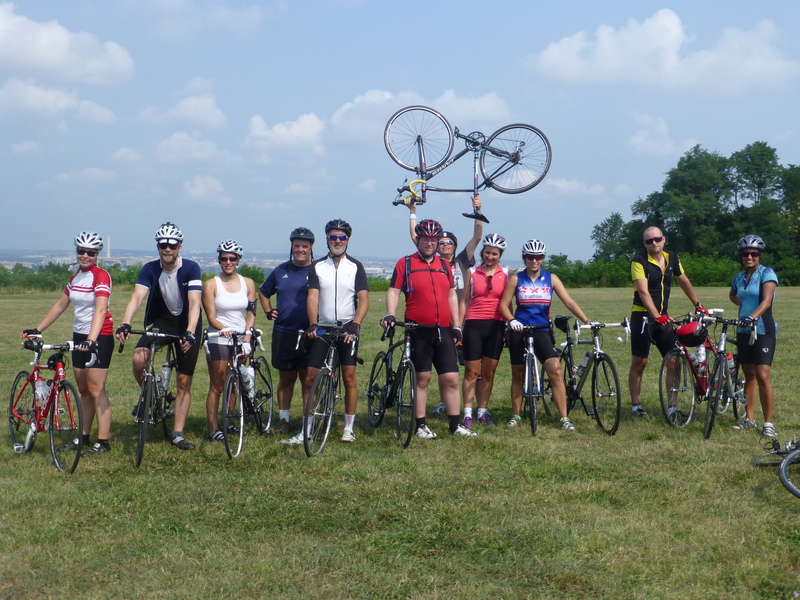 If you are relatively new to DC, biking, or both, joining a group ride is the absolutely best way to get started. Pretty much all the DC bike shops organize weekly group rides. 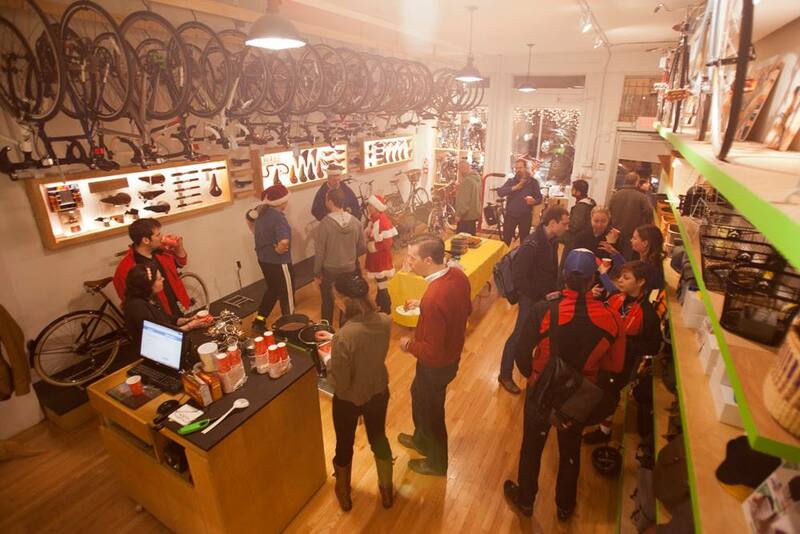 For example, the 7th Street Social organized by my favorite bike shop in town, BicycleSPACE (700 5th St. NW), on Thursday nights is a classic. They also organize Nice-N-Easy rides for people who are new to (urban) biking, and several others for more experienced cyclists. I can highly recommend the Hills of Anacostia ride if you feel like starting your weekend by acing killer hills in SE DC, and the City Explorers ride if you just happen to be a very curious person like me. If you wish to go all out on a road bike, check out the group rides organized by The Bike Rack (14th & Q NW). You might also find like-minded company in the DC Triathlon Club. DC traffic may feel like a jungle first. Once you get used to it (which took me about three weeks), bike commuting becomes a real joy. In addition to saving you time and money, it makes you happier, healthier, and more productive. The list of benefits is nearly endless. As the winter in DC is relatively short – at least compared to Finland – and the streets are seldom icy, it is possible to commute by bike almost year round without any particular winter riding equipment apart from warm clothes. As a bonus, on rainy and cold days you can often have the bike lanes all for yourself. Washington Area Bicyclist Association, WABA, does an amazing job promoting better bike lanes, better bike laws, and better bicyclists in DC and in the surrounding metropolitan area. They run an impressive range of advocacy activities, and additionally they organize classes and events. WABA also runs a Women & Bicycles program to encourage more women to pick up biking. Coming from Finland where biking is roughly equally common among men and women, it was quite a shock to realize that in DC less than 30% of cyclists are women, so the program is very much needed. (Many of the Women & Bicycles activities were actually so awesome that we might want to copy them with pride in Helsinki anyway.) Read more about WABA and become a member today. 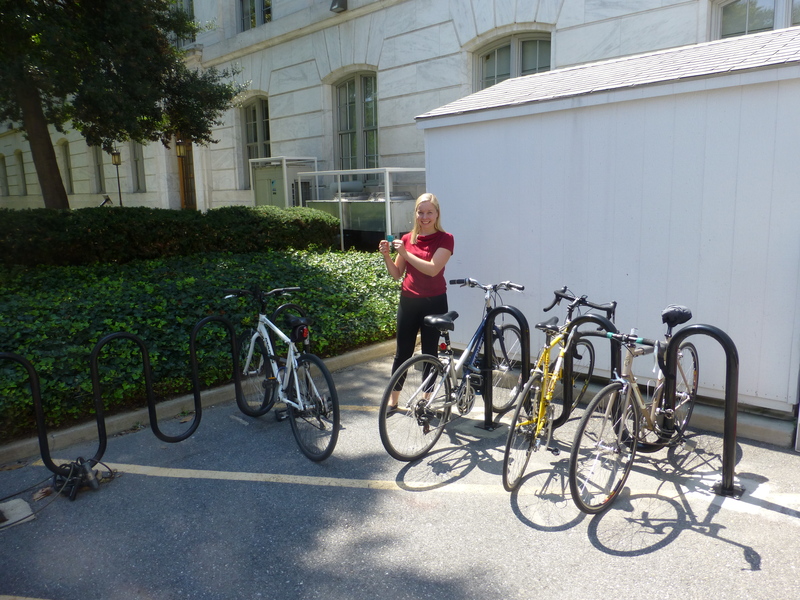 Inspired by WABA’s example, I decided to convince the American Red Cross headquarters facility management to invest in an additional bike rack. 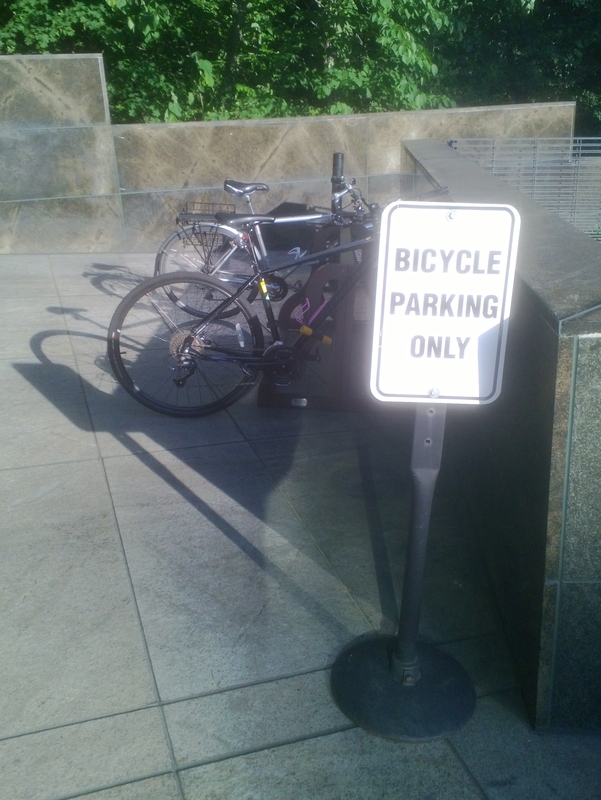 The earlier bike parking capacity simply was not enough when the weather got nicer in spring. I started lobbying for an extra bike rack in April. After four months of chasing, a brand new rack was assembled at the Red Cross Square just before I finished my Fulbright project. I could not resist decorating it with a Women & Bicycles sticker on my last day. There are loads of bike related special events throughout the year. In addition to WABA, especially BicycleSPACE has been super active in organizing them. I went for example to their Halloween themed ride, Holiday Lights ride, and Holiday Party. Both BicycleSPACE and The Bike Rack also offer weekly yoga classes in their stores outside the regular opening hours. Additionally, The Bike Rack organizes events specifically for women. Every now and then there are even public alleycats in DC. These urban navigation and problem solving races were originally a cult thing among bike messengers only but now there are also events open for anyone. 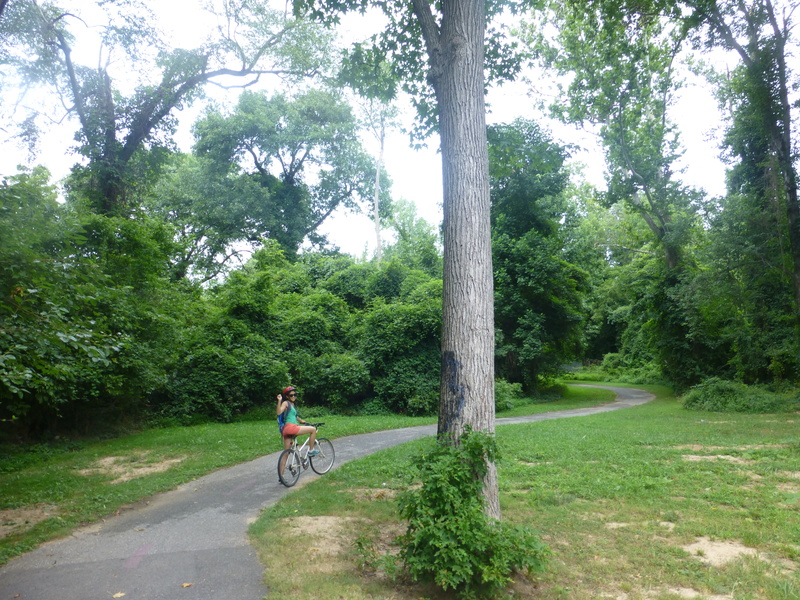 If biking with traffic does not appeal to you, don’t worry, there is a wealth of trails in the DC area as well. Some of the most popular ones are the Mt. Vernon trail (gets hilly towards the end), the Four Mile Run trail, the W&OD trail, and the Custis trail. 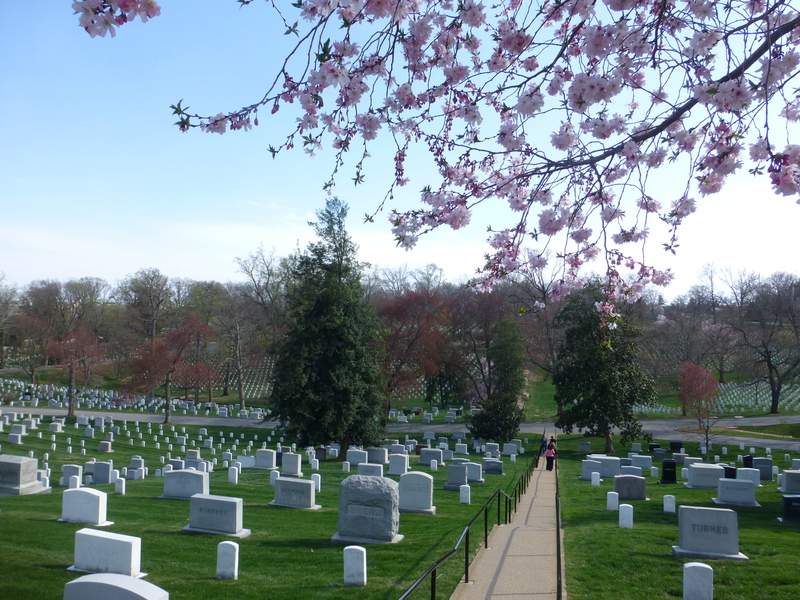 Parts of these also form a nice roundtrip also known as the Arlington Loop. Once you have covered these, you can head to the Capital Crescent trail (very scenic and paved), C&O trail (very scenic, but unpaved), the Metropolitan Branch Trail (spot murals along the way), the Bethesda Trolley Trail (a little hard to navigate), and the Sligo Creek Trail (excellent ice cream in Takoma Park). Additionally, large sections of the Beach Drive in the Rock Creek Park is closed from cars during weekends. Many road cyclists also enjoy doing “lycra laps” in Hains Point and biking to the Potomac Village even if that means sharing the road with cars. If you have ever wanted to learn bike maintenance, in DC it is very easy. 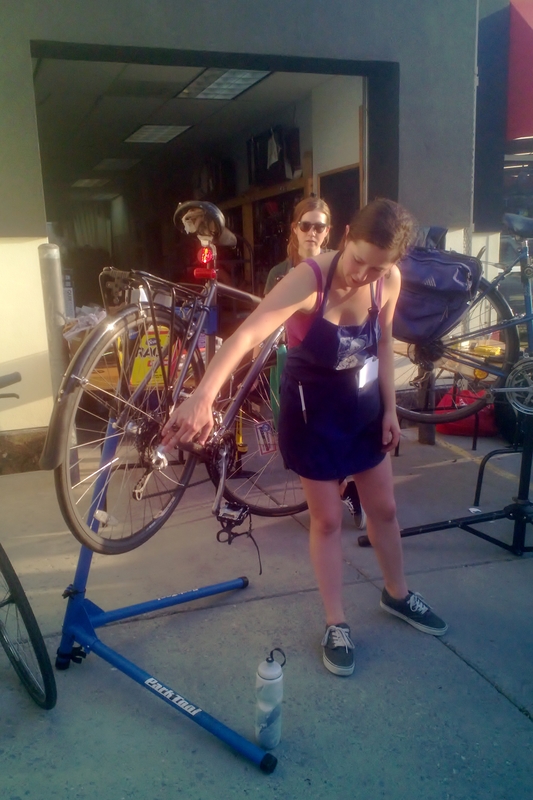 Bike shops offer basic maintenance and fix-a-flat workhops on a regular basis. These are often completely free of charge. A fantastic community-based bicycle repair cooperative, the Bike House, also organizes more in-depth maintenance courses for a nominal fee. I attended their excellent four week long course in Petworth in May. I could not have imagined how much one can learn about brakes, gear, cables, hubs, and spokes in such a short time. So empowering! Highly recommended. The Bike House is completely volunteer run. 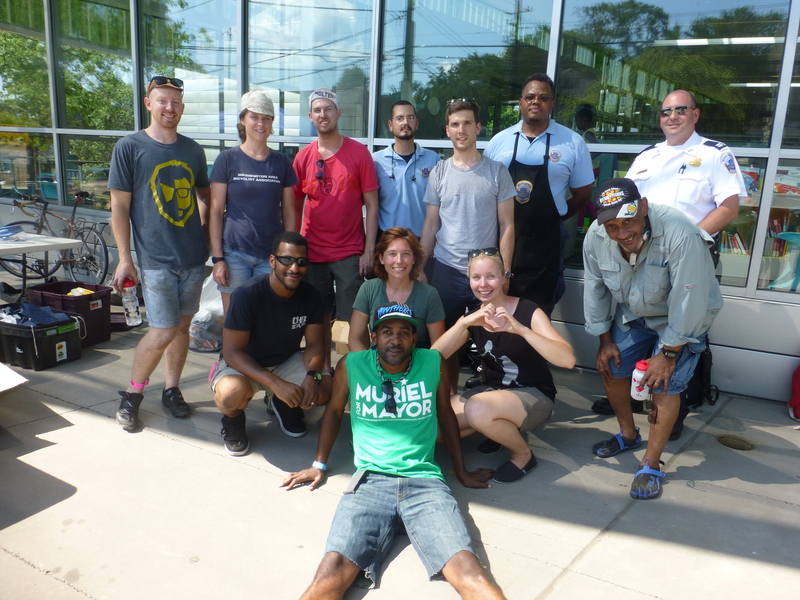 In addition to offering bike maintenance courses, they organize weekly bicycle repair clinics at Petworth and at the Bloomingdale Farmers Market. Every now and then they also do the same in other locations, often in the spirit of outreach. In summer 2014, the Bike House teamed up with DC Public Library, WABA, and DC Police and organized four clinics in Anacostia in SE DC. I joined one of these clinics as a volunteer. That turned out to be one of the most rewarding and eye-opening experiences during the entire Fulbright year. Whenever one stops at traffic lights, it is worth glancing down: There are small witty stencil pieces with biking related messages painted on the bike lanes around the city. What a brilliant form of street art! Check out some more of my photos on Flickr to get an idea. Unfortunately, the mysterious artist has had to take a break of stencil activism for now, but I’m sure many of the pieces are still visible. 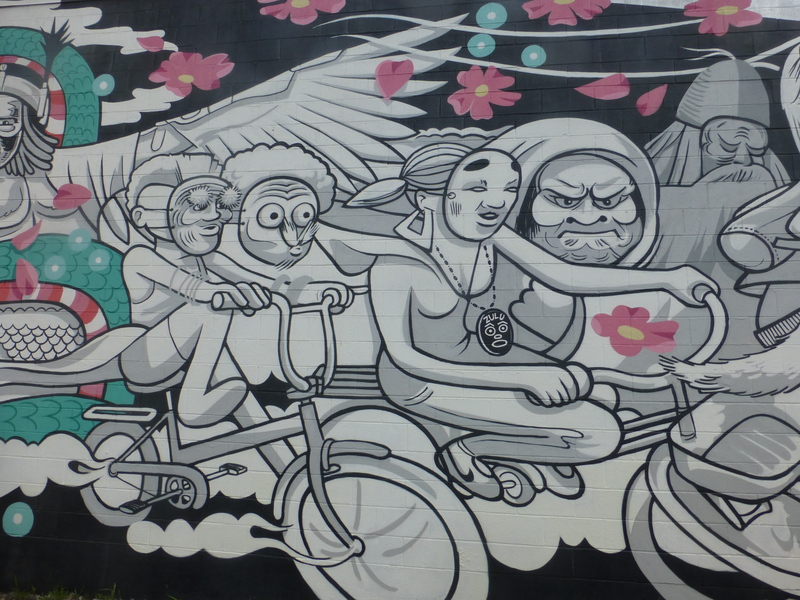 For an urban art junkie like me, mural tours by bike were a treat. As a bonus, they are also an excellent way to explore DC neighborhoods that you might not feel totally comfortable checking out on your own. A hip-hop nonprofit Words Beats and Life organizes mural rides in cooperation with BicycleSPACE a couple of times a year. Also, if you have any designer connections, you might want to check if AIGA DC is planning another mural ride. Each Wednesday morning a group of bikey women swing by the Coffee Bar (or another carefully selected location) on their way to work for a cup of coffee and some bike talk. 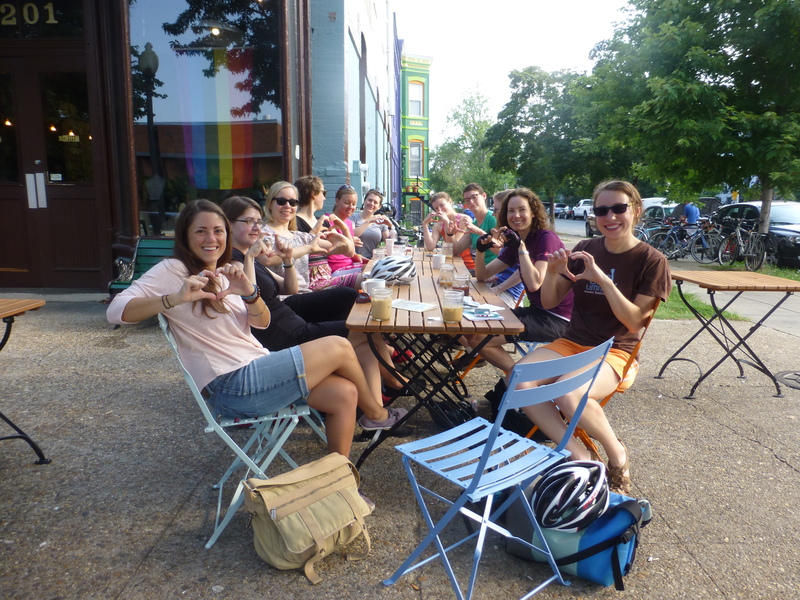 These weekly informal gatherings hosted by awesome Nelle from WABA are a part of the Women & Bicycles program. They are a great way to meet like-minded people, get tips and peer support – often also in non-biking related matters – and generally become energized. On Friday mornings, there is a co-ed Coffee Club at Swings (17th & G NW). The DC biking power couple Mary and Ed founded the coffee club some three years ago, and it has become an institution. I do not even drink coffee, yet these morning coffee clubs might be the DC routine that I miss most. The third time definitely was the charm. My Independence Day did not start too well as I had a terrible cold. After spending the day in bed, in the evening I still decided to leave the house, hop on my bike and head downtown to meet up with friends. I’m so glad I did! I had been invited to a friend’s friend’s rooftop to watch the fireworks. 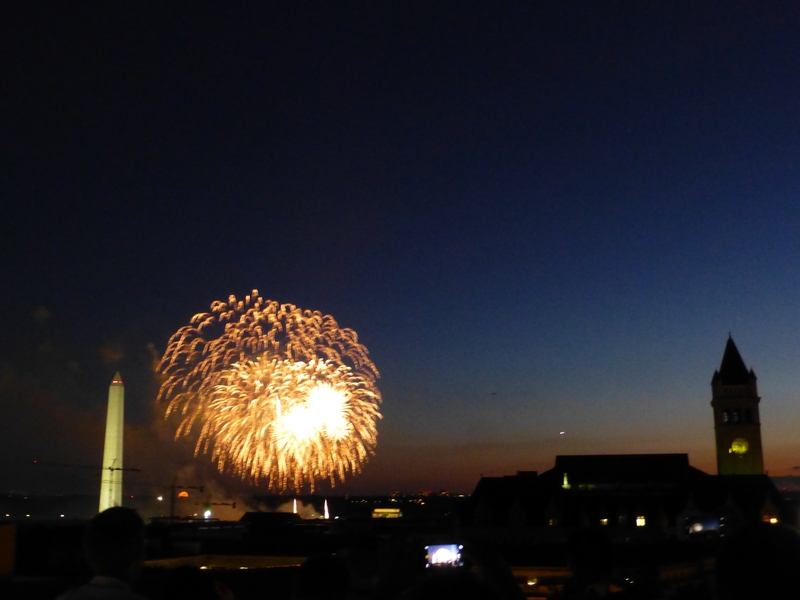 The vantage point was fabulous: an unobstructed view of the Washington Monument, the Old Post Office Tower, the sunset, and magnificent fireworks. 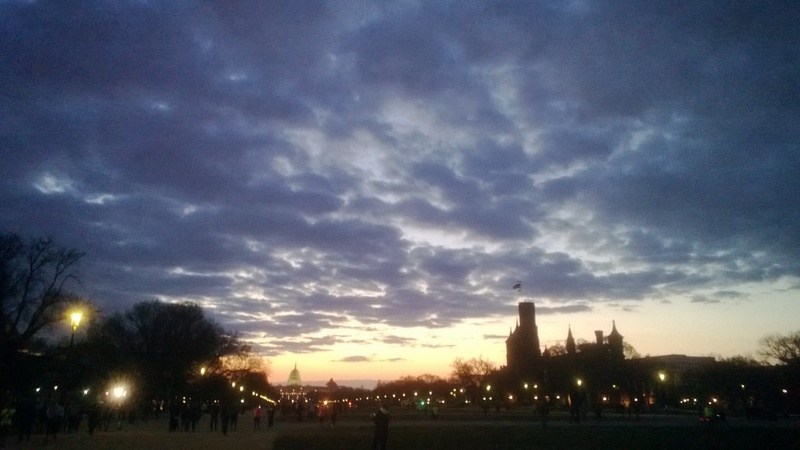 The view of the U.S. Capitol was not too shabby either. It made me think of my first 7th Street Social bike ride in September, and all the great things that had followed. I love to brag how Helsinki is such a unique capital city as there is so much nature just a stone-throw away from the city center. I was astonished to discover that DC has a bit of the same flavor. The Rock Creek Park has a feel of a real forest, and paddling on the Anacostia river makes one forget the surrounding huge metropolitan area instantly. My first paddling experience on the river was in May in a wonderful free event organized by Casey Trees. During our couple of hours of paddling we even spotted a turtle and a beaver! 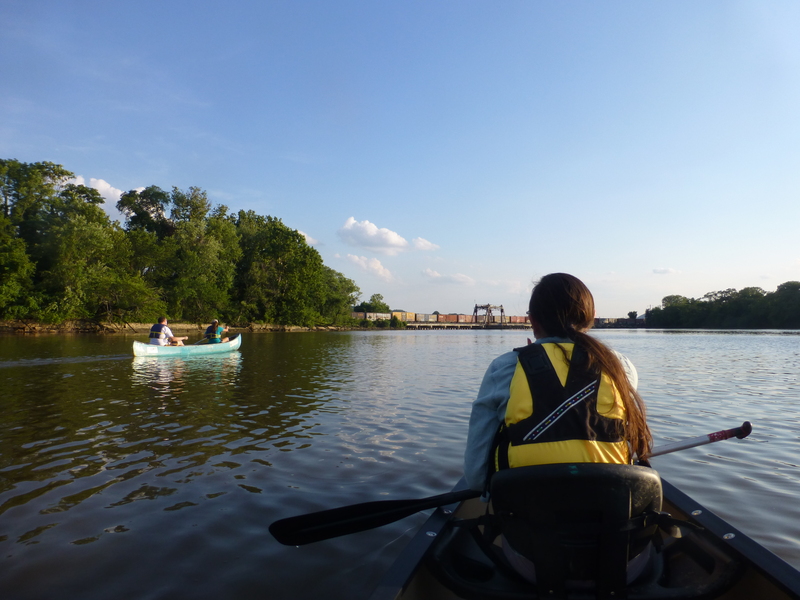 In July I had the opportunity to get on the river again, that time to celebrate the anniversary of the Anacostia Watershed Society. So peaceful, so relaxing, highly recommended. Both Casey Trees and the Anacostia Watershed Society are worthy organizations doing invaluable work to preserve urban nature. They offer a vast array of exciting and fun ways to get involved. Have a look! Two of my roommates got married in June. Due to my conference in Florida, I was unfortunately not able to travel to Italy to attend the actual wedding. Luckily, the groom’s mother organized a wonderful Welcome Home party for the newlyweds in July. The event started with the blessing of the marriage at the Russian Orthodox Cathedral of St. John the Baptist not far from our house. I had become very familiar with the cathedral during my triathlon training, as I ran by it on most of my morning runs. Actually my favorite hill for hill repeats was right by it. I had never had a chance to peak inside, though. 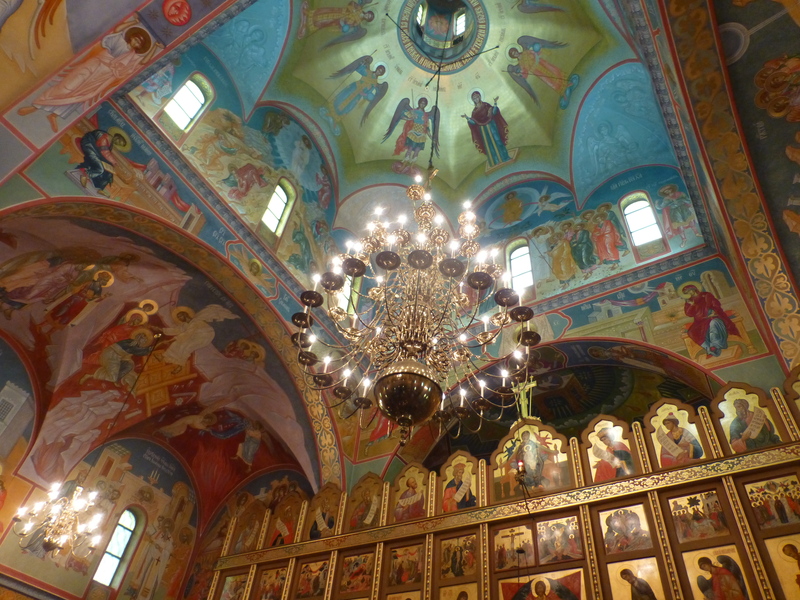 Seeing the incredibly beautiful interior was like stepping into another world. 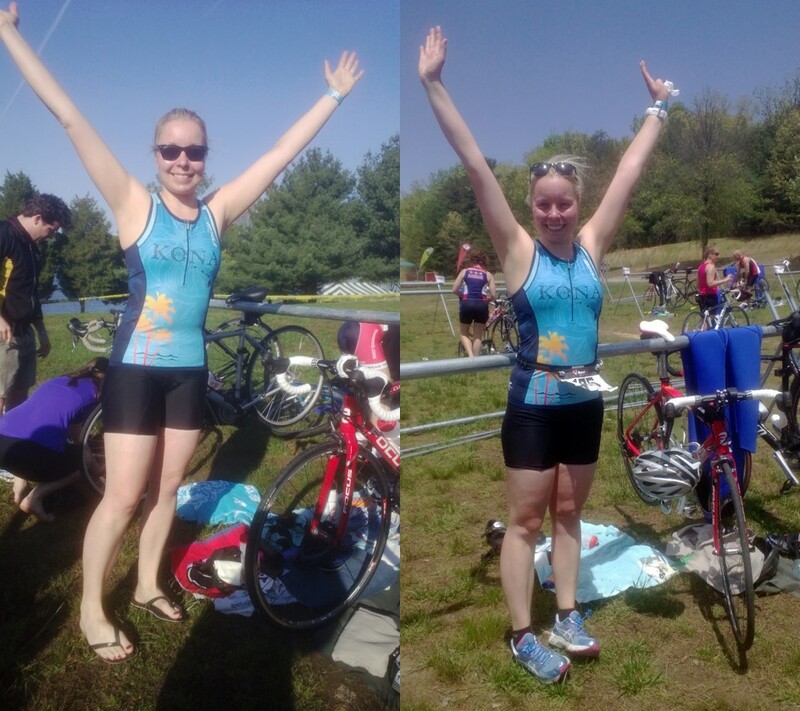 This is a very long overdue race report of my first Half Ironman triathlon (1.9 km / 1.2 mile swim, 90 km / 56 mile bike, 21.1 km / 13.1 mile run). 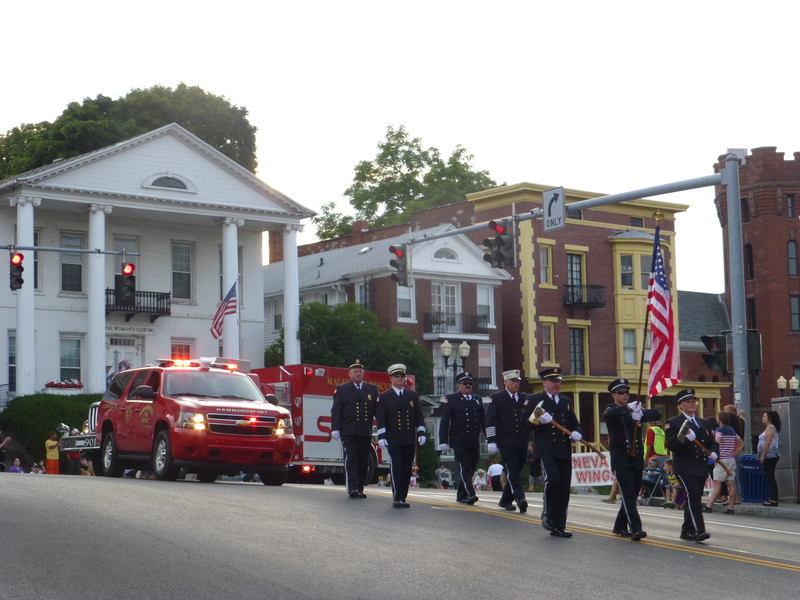 The race took place in Geneva, NY, on July 13, 2014. It was followed by a quick reward trip to Toronto and Niagara Falls. Most of the report was written in August 2014. The blog post was finalized in Gisborne, NZ, in January 2015. All of a sudden my 5-month-long Half Ironman training program with the DC Triathlon Club had come almost to its end. The only thing remaining was the race itself, Musselman. Since the beginning of the program, our coach had highlighted the importance of practicing race nutrition and finding your optimal menu. I like to take pride for eating being one my strengths, so over the months I had tested more brands and products than I had ever even imagined existed. On the Thursday night preceding the big race day, my mission was to replenish the last missing favorite items. After visiting nine different shops looking for Power Bars in my favorite flavor without success, a heavy thunderstorm caught me on my bike ride home. I had to seek shelter at the entrance of a grocery store. While waiting for the rain to stop, I had a sudden nervous breakdown. How could I have known that no one likes Mixed Berry Blast Power Bars in DC? Who is behind the conspiracy of selling only Chocolate, Peanut Butter, Chocolate Peanut Butter (seriously! ), Vanilla, and Cookie Dough here? Why had I not tested all the nutrition offered by organizers in advance? What are gRUNola bars anyway, and where would they have been sold? And what if my nasty cold that hit the week before the race is not gone after all? Is it even safe to start the race? Why did I have to travel to a conference in Orlando just before the race although I always get sick after flying? And why did I decide to do the Pittsburgh-DC bike tour in May although I knew it was risky? What if the paralyzing knee pain returns on the bike and forces me to stop? Or what if my left bunion gets sore in the cycling shoes again? Why am I still using my touring shoes for triathlons anyway? And what if I get a flat? Or the chain breaks? Or I am unable to unclip my bike shoes and fall? Or cause a crash by stopping at an aid station? What if my running shoes give me a hard time like they occasionally do? Why did I not buy new ones at least a month ago? What if my goggles get foggy on the swim? Or if someone kicks me in the head? What if I forget to pack something important? Why didn’t I do the packing on Tuesday night despite all my good intentions? Why did I not train more? Why on Earth is our washer broken exactly today and I have to go to a laundromat? And why can’t the rain stop already? A few hours later – after writing a race plan in the laundromat – I returned to my usual zen-like calmness. Writing the race plan was tremendously helpful. 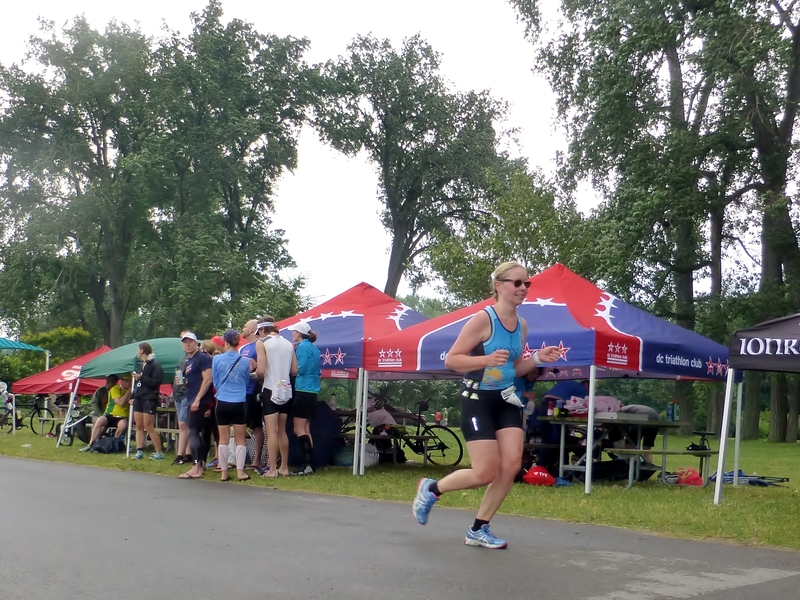 I wrote down what to do the day before the race and what to do in the race day morning, what to wear, what to eat and drink before the race, on the bike, on the run, and in the transitions, my estimated split times, and even my sunscreen strategy. After doing this I knew I only needed to stick to the plan, no matter which miraculous gear or nutrition inventions I would see in the race expo or being used by other athletes, and everything would be fine. The actual Musselman adventure started on Friday afternoon. I felt extremely happy that one of my DC friends was crazy enough to volunteer to join the trip as my driver, photographer and mental support. We left from Columbia Heights around 5PM. Luckily the Friday traffic around DC and Baltimore was not as bad as I had feared. The rest of the drive was on the roads of rural Pennsylvania that I am starting to be very familiar with. In Jonestown, PA, we had an awesome ice cream break at a local campground. That was pre-race nutrition to my taste, best enjoyed on a porch in a rocking chair just before sunset. We made it to the tiny town of Orangeville, PA around 10:30PM. (In this case tiny really means tiny, as the population was 500 at the 2000 census.) Our Airbnb hosts had not returned home yet, but the front door was unlocked. A sign of true countryside! I had promised to the lady of the house that I let their dog out when we arrive. I was a little nervous about the task. 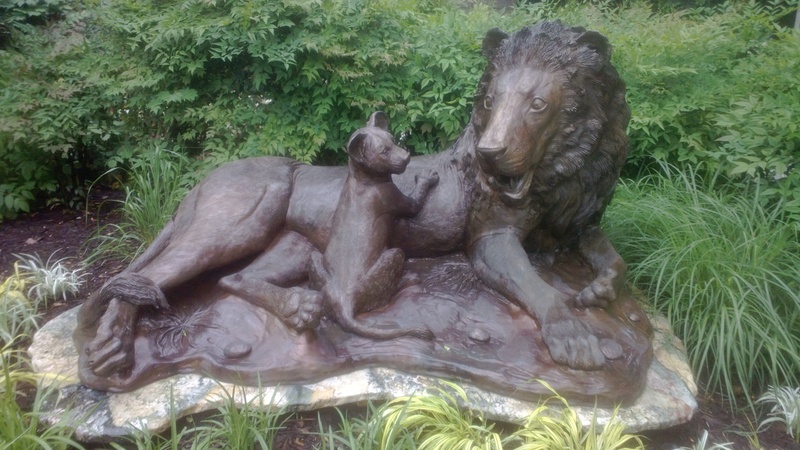 Fortunately, their boxer Pluto turned out to be friendly and harmless. It did not seem to mind me speaking Finnish. When I got to the bed, it did not take many minutes to fall asleep. On Saturday morning we woke up to sunshine in the middle of the cornfields. I sent my friend out for a run while I checked the last logistics details of the day, like local addresses of key locations in Geneva. Our super sweet Airbnb host served us breakfast, and we had a nice chat about travel and life. The lady was impressed by my friend’s morning run. When she heard what Musselman was about, she seemed a little confused. She wished me luck and gave me a hug, like if I was leaving for war. Then it was time to hit the road. 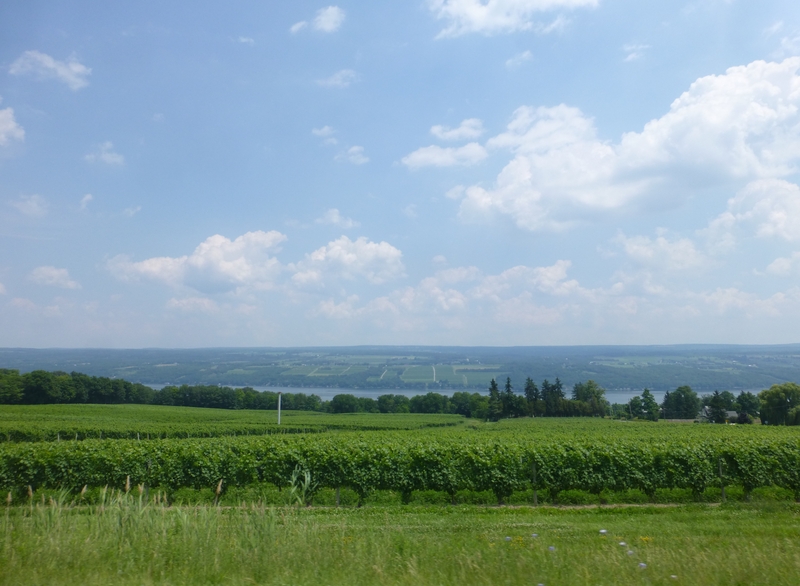 The drive to Geneva was beautiful, especially the last 30 miles or so along the shores of the Seneca Lake. Arriving in Geneva was awesome. Musselman was visible everywhere. It felt like every car had a bike rack on. We drove directly to the race expo on the campus of Hobart & William Smith Colleges to pick up my race packet. I always feel very relieved when I finally have my bib and timing chip. Before races, I often see nightmares of being late from the packet pickup. 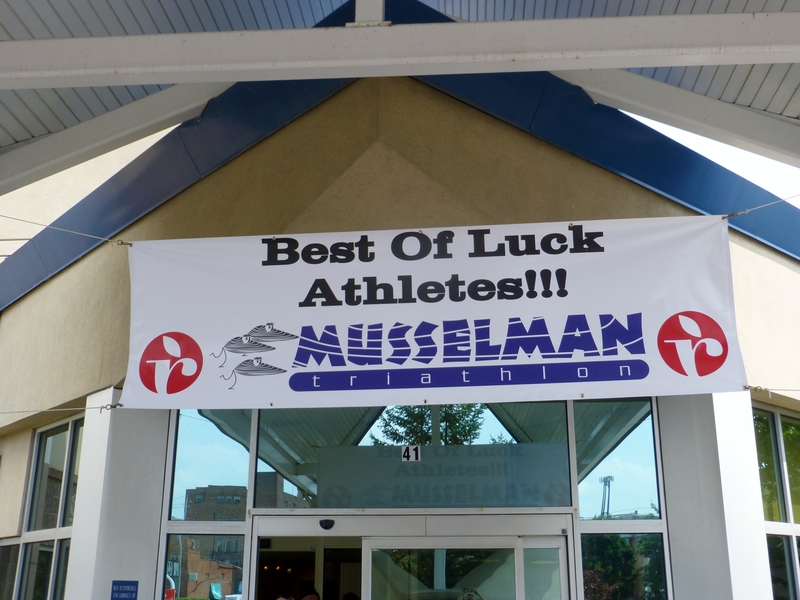 The banner welcoming Musselman athletes to our hotel reminded me of all the Ironman banners I had seen in Kona in October. The rest of the day flew by. I had hoped to have time for at least a small swim before the pre-race info session, but I realized that was overly optimistic. Eventually we barely had time for a quick salmon sandwich lunch and signing the MusselMural. To my surprise, the only tools available for the mural project were paintbrushes. Next time I will show up with my own stencil and spray paint! 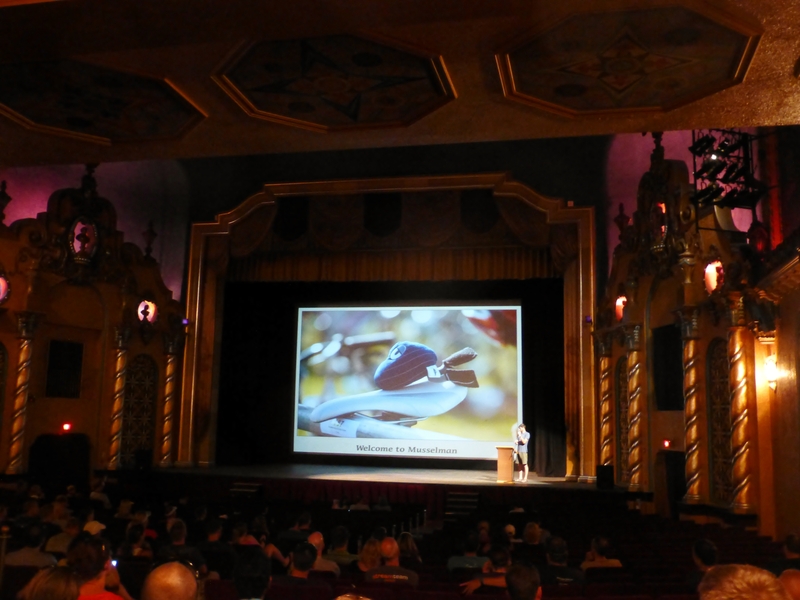 The pre-race info session took place at the Smith Opera House, definitely the fanciest pre-race meeting location that I have ever come across. I’m not sure if the info session made me more nervous or relaxed. I adored the fun-loving atmosphere and hearing about the local specialties, like zebra mussel safety (the mussels are sharp, but the lake is safe as long as you swim and do not walk) and what to do if you need to pass a horse and a buggy (not a rare scene in the Mennonite country). Then again, I had somehow managed to avoid the fact that last year there had been two deadly accidents on the Musselman bike course. This year’s race was in memory of these two athletes. White ghost bikes were honoring them on the accident scenes. I tried to keep calm and keep in mind that at least these athletes died doing something they loved, but I could not help feeling very sad, disheartened, and scared as well. Fortunately, the next event was an uplifting pre-race dinner at a fellow DC Triathlon Club member’s parents’ garden. It was awesome to see many familiar faces and chat with energetic fellow triathletes full of excitement and fighting spirit. Conversations were light-hearted, and I taught a few people the word ‘sisu‘. After the dinner, we got distracted by the Geneva Firemen’s Parade for a moment, and then eventually made it to the race site. I reassembled my bike, did a quick test ride to see that everything was ok, racked the bike, checked out the layout of the transition area, and even dipped my toes in the lake to feel how warm the water was. Then we returned to the hotel to take care of the remaining preparations. 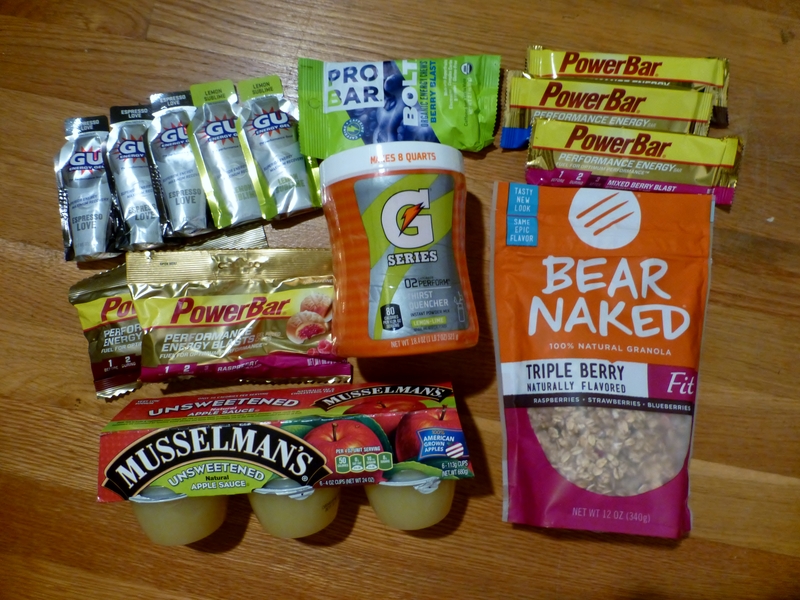 So many little things to take care of from attaching the bib number to the race belt and stuffing the “bento box” (a small bag that is attached to the front tube of the bike to give easy access to nutrition during the ride) with opened energy chew bags and pre-cut Power Bars. Like always before a race, it was way too late when I finally I had everything ready, almost midnight. Amazingly, I was able to fall asleep quite easily again. Time flew by also in the morning, but thanks to the race plan, things did not get too chaotic. Despite the cloudier than expected weather forecast, I made sure to marinade myself in sunscreen just in case. I braided my hair, added ice to water bottles, wore the heart rate monitor strap under my tri-top, and I even remembered to set a band-aid inside my tri-top zipper to make sure that it won’t chafe. We checked out from the hotel around 5:30AM and headed to the race site. 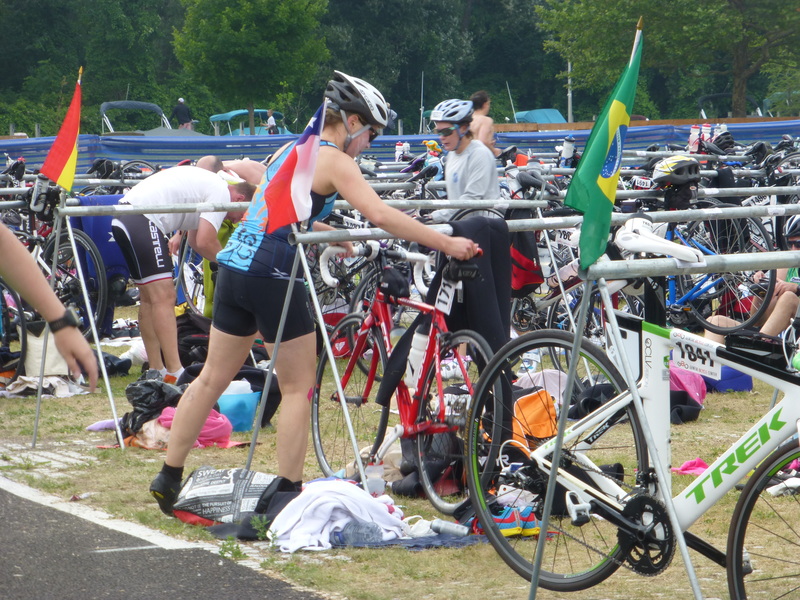 Body marking was the first ritual before anyone was let to enter the transition area. Instead of fancy Ironman style number tattoos, the volunteers simply used a Sharpie to write the bib number on everyone’s left arm and leg, and the age in the end of the year on the calf. After this, setting up the transition did not take too long. The only thing I screw up was that I did not realize to use my big plastic bag as a rain cover for all the gear. That early in the morning it did not look like it was going to rain. In the race expo I was instructed to go to the medical tent in the morning of the race day to get my knee KT taped professionally. There was no one at the tent. Luckily, I still had a piece of pink tape that I had got from my guardian angel Claire at Rose Physical Therapy. With her instructions I taped my right knee myself in the same way as she did when I visited her before Bike Virginia. As I used only one layer of tape, the impact was probably primarily on the mental side. Then again, the importance of the mental side should never be underestimated, especially because I had selected pink tape on purpose. 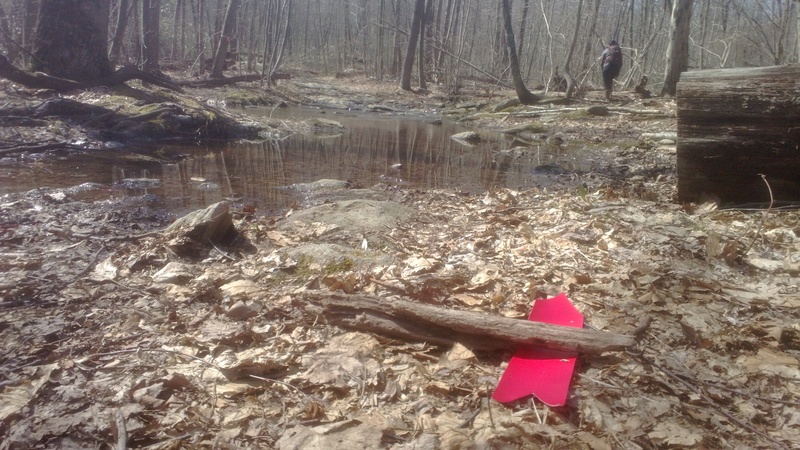 The symbolic value of that piece of pink tape was much more than anyone in the race site knew. In summer 2013, a Finnish elite triathlete Elina Jouhki finished 9th in IM70.3 in Haugesund, Norway, right after surviving breast cancer. This summer she intended to race in Frankfurt Ironman. She created Team Pink Wheels to raise money for cancer research and raise awareness of the Finnish Stem Cell Registry (maintained by the Finnish Red Cross!). Sadly, leukemia forced Elina to stop training in April. The Finnish triathlon community – including our current Prime Minister Stubb – decided to carry out the plan of racing with pink wheels and/or wearing pink. I did not have pink wheels on my bike, but the pink tape on my knee made me unofficially part of the Team Elina Jouhki. Ever since April when hitting obstacles in training (or in life), Elina’s amazing story and example have helped me to put things quickly into perspective and carry on. You can read more and show your support here. The remaining pre-race routines included crawling into the wetsuit, dipping into the lake to get an idea of the conditions ahead, swallowing the first energy gel of the day, and drinking a cup of water. The only discrepancy to my race plan was forgetting to set my heart rate monitor on my bike. 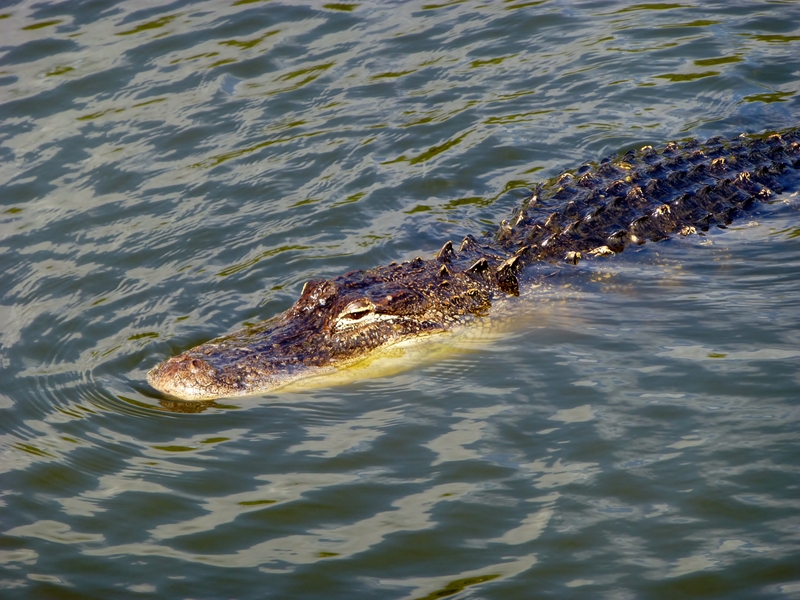 I had not planned to swim with it to avoid any unnecessary hassle in T1. When I realized I still had the watch on my wrist, there was no longer adequate time to bring it back to the transition area, so I just had to go with it and take this as an opportunity to test its multisport features. Just before the race start there was a moment of silence for the athletes who tragically died the year before. Chills. Then the national anthem, then time to get into the lake. Swim 1.9 km / 1.2 miles: Men 30-39 years got going at 7AM. Our swim start was 5 minutes after them, and 5 minutes before 40-49-year old men. The latter fact was a slight source of concern for me, as I knew a lot of these men would reach me, and in the worse case swim over me with full force… The lake was very shallow at the beginning of the swim, so a lot of athletes opted to walk to first hundreds of meters, but I decided to start to swim right away, having the mussel safety guidance fresh in mind. The last thing I wanted to happen was to step on a sharp shell. Swimming felt great right away, although the water was murky. After the first buoy, the conditions got much choppier and rougher. At some point the waves got so high that you had to wait to be on top of a wave to see where the next buoy was. I thought about the words of the coach at the Lake Anna open water swim clinic about always turning the conditions to your advantage. I knew that for a lot of people these ocean-like conditions were a disaster. I was happy to realize that they did not scare me at all. I knew I would not drown and that I would make it. At the same time, it was obvious that the waves would make the swim much more energy-consuming and somewhat slower than in a calm lake. After a small eternity, I finally reached the half way point of the swim. The second half was in a canal, so things got somewhat easier – no white capping waters. I was done with the swim in 51:18. T1: When I got out of the water, I was surprised that I did not feel very dizzy. Sometimes getting out of the water feels like leaving a student party at 4AM… I was still dizzy enough to mess up recording my split times with the heart rate monitor, though. 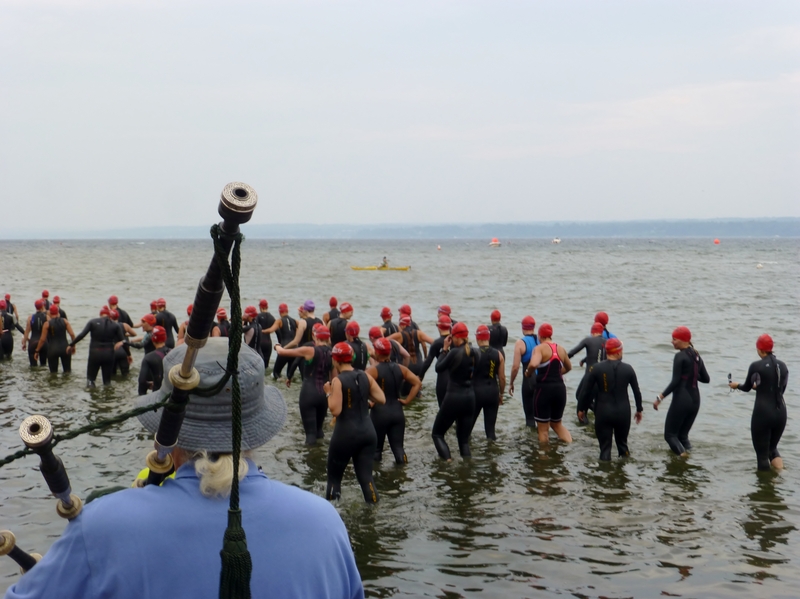 A mental note taken to learn to use the multisport features properly before the next race… During the swim, I had promised myself a bathroom break in T1. That turned out to be a good pit stop strategy, as there was no waiting in line. Getting out of the wetsuit went desirably uneventfully, and so did the rest of T1. I stuffed the first bag of energy candy to my mouth, set the heart rate monitor on the bike to serve as my dashboard, got into my cycling shoes, grabbed my helmet, and even added sunscreen just in case. All this in 6:10. Bike 90 km / 56 miles: Due to the knee issues that I developed on my commuter hybrid on the way from Pittsburgh to DC earlier in the summer, I had decided to take the bike ride very easy, making sure to have so high cadence that my pesky knee should not get irritated. I had also promised to myself that I will respect my inner grandma and not take any risks at all that could compromise the safety even if that meant I was the slowest cyclist of the day. Needless to say, I had the tragic stories from the previous year in mind. After the first 16 km / 10 miles I started to suspect that my grandma tactic might not work. I had spent almost an hour to complete them. I made conversions between miles and kilometres over and over again in my mind. Each time the conclusion was the same: With that speed I would need almost six hours to finish the bike! That would obviously mean exceeding the maximum allowed race time big time, becoming unofficial and/or being pulled off the course. Very depressing. Luckily one of the super fast cyclists passing me told me “just to wait for the tailwind”. I did not have any experience of biking in strong headwind, so his comment made me a little more optimistic. When the course turned towards north, my speed almost tripled. I barely needed to pedal to swish forward at least 40 km/h / 25 mph. I had never experienced that type of sustained pace. It was like flying! I realized that if I can take the advantage of the wind behind me, I was back on track and had a great chance to complete the bike in time. Then it started to rain. Heavily. Torrential rain showers rather than drizzles. Like we say in Finland, we are not made out of sugar or paper, so being soaking wet was not an issue. The issue was that rain can make roads extremely slippery. So there I was, biking on wet roads in crazy wind faster than ever in my life. The only thing that could make the conditions more absurd were “horse poo bombs”. Even if I did not need to pass any Mennonite buggies, I could tell Mennonites had not skipped their Sunday church visit, as there was horse poo on the roads at regular intervals. I definitely did not want to make history as the cyclist who slipped in horse poo and crashed. I kept my eyes so carefully on the road that I might need to go back one day to check out the apparently exceptionally beautiful landscape on the bike course. Up until a few weeks before the race I was still super scared to drink or eat while riding. Practicing that paid off and grabbing water bottles had started to feel pretty natural. I had still decided to stop at the aid stations to make sure that I get enough nutrition and hydration. Towards the end of the bike I realized that it was actually very easy to grab energy candy from the “bento box” while riding. As I love candy in pretty much all forms, I stuffed so much of them in my mouth that there was a funny moment at one point when I had to pass a slow guy struggling to pedal uphill. With my mouth full of candy, I tried to follow the protocol and warn the guy by yelling “on your left”. Then I actually found myself telling him that my mom has taught me that it is rude to speak when your mouth is full and apologizing for my bad manners. And then we both laughed as after biking three hours or so in strong winds and severe thunderstorms, my not-so-royal behavior probably was not a very big deal. Like many endurance athletes could tell, during the race you have very emotional moments. Even if there are a lot of things happening around you, in the end you still are mostly alone in your thoughts. Often there are phases when you are cursing and regretting the whole idea of signing up for the race (and any future races). And then there are moments when you just love life and feel grateful for your body and for the amazing experiences it can take you to. I also always feel sentimental when I think of all the people that have supported me on my way towards a big goal, like this one. I often visualize them with me on the course, especially all my training buddies that I have been biking or running with. This time I even imagined some two thousand Women & Bicycles community members on the course around me. I also spent quite some time thinking through who all should be included to my Oscar gala style thank you speech. When I completed the bike, it felt like I had finished the race. It took me 3:55:45, but my knee had not let me down, there were no technical difficulties with the bike, and I had arrived safely. 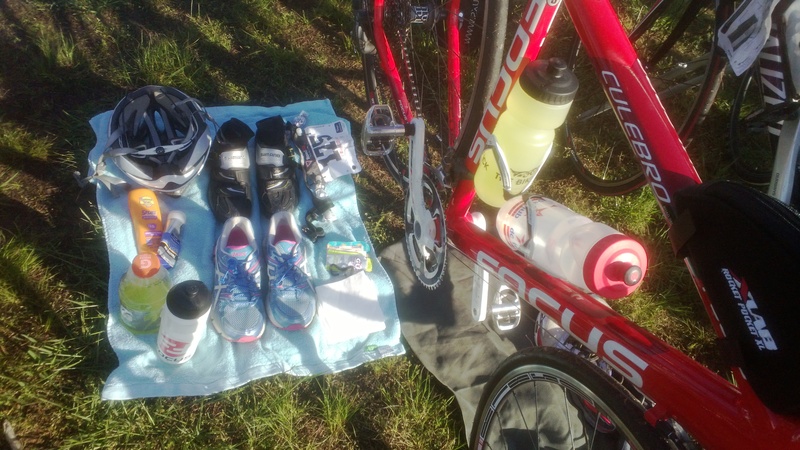 T2: When I got to my transition spot, I found all my gear completely soaked. I really should have realized to put them in a plastic bag in the morning… Oh well. I quickly changed to my wet running shoes, put on the number belt and grabbed my hipster sunglasses, the same ones that I wore on my first marathon in Berlin. Considering the weather conditions, there was not a real need for sunglasses, but the weather had changed so many times during the day that I figured having them along would not hurt. And it would be fun to finish wearing them. The T2 took 4:00. Run 21.1 km / 13.1 miles: Getting out of T2, I felt a little lost. I had been so focused on the possible knee issues on the bike and the risk of having to stop that I had not really thought through what exactly happens if I actually make it to the run. I had been almost five hours on the go by that time and I knew I would need another 2.5 hours or so to crawl through the half marathon. The fastest athletes had obviously already finished the whole thing by the time I even got started with the run, and I saw some of them happily eating ice cream by the course. Had I not binged so much energy candy on the bike that I actually felt a little too full, I would have been very envious of that ice cream. Even if it was a rainy day, the temperature was still easily around 25’C / 77’F. A cool summer day for Geneva, but more than enough for a Finn. At each aid station I asked for ice, put some under my tri-top and even held ice cubes in my hands to cool down and keep going. Other remarks from the run: a nasty blister from early on, more than enough hills, and unmanageable difficulties to push oneself to run when most others were walking. Finally I crossed the finish line after 7:38:15. My slowest timed half marathon ever (2:41:02), but it made me a Musselman. DC Triathlon Club had a tent just before the finish line, and as most people from the club had finished before me, there were loads of friends cheering when I arrived. This reminded me of the amazing finish line party in Kona just before midnight. All in all, it was incredible that even us who “maximized value for money” by spending well more than 7 hours on the course got to enjoy the same level of support on the course as the faster guys. The bands kept playing, and it was so touching to have people cheering despite the rain. After the race, the best part was catching up with others and hearing war stories of the race. I was also thrilled to spot some American Red Cross blankets, in my case useful primarily for posing purposes. The Red Cross really is everywhere! I was also hoping to get a free massage which turned out to be a free first experience of chiropractic treatment instead. Luckily it was not very painful, and judging based on the noise that came from my neck during the treatment, it was probably only a good thing that someone put my head back to where it belongs. The vegetarian post-race meal was not the biggest culinary success, but I managed to eat at least a little bit of something primarily cookies. Then it started to be about the time to clean up the transition area, have a quick shower, pack the car, and head towards the next destination: Toronto. I had wanted to visit Toronto for a long time. When I realized that Geneva is not very far from the Canadian border, I figured that it was a brilliant idea to drive there after the race. From the logistics point of view this probably was an ok idea indeed. From the recovery point of view it might have made more sense to stay in the Lake Seneca area, take it very easy, have a big dinner, go to sleep, and then maybe hit a few wineries on the following day. Instead, we spent some 5 hours in the car right away on Sunday night, a significant amount out of this at the border crossing waiting for our turn to enter Canada. It was very late at night when we arrive in Toronto. Luckily, we found our B&B in Cabbagetown easily as well as the secret parking spot reserved for us. Finding the correct bedroom in the house was slightly trickier, and we may have accidentally woken up at least one Asian businessman in the process… Quite some creativity was required also to figure out where to hang all the wet gear. I also realized that I had forgotten to warn our South African host about the bikes, but fortunately she did not mind too much finding them parked inside her beautiful villa. After a restless night of sleep – very typical for me after a race, might have something to do with the caffeinated energy gels – it was time to explore Toronto. Strolling around the city with very sore legs was pretty painful but definitely useful for recovery. Slowly but surely we wandered around the city. 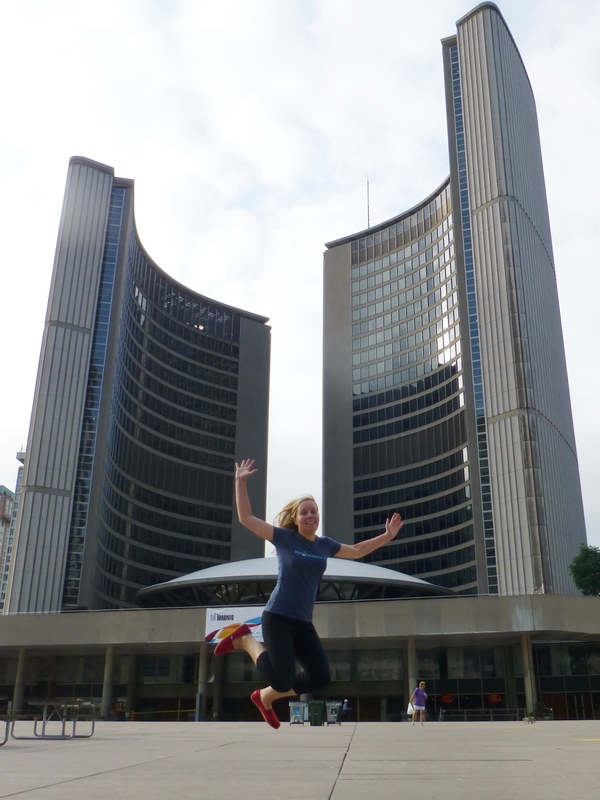 In addition to the obvious tourist drag CN Tower with amazing views over the city, we went to see the Toronto City Hall. No one, including the border control officer on the night before, seemed to understand why the City Hall was so important. The catch of course is that the building is designed by my favorite Finnish architect Viljo Revell. We had also planned to visit the Signs Restaurant where all the waiting staff are deaf and customers need to use American Sign Language (ASL) to place their orders. My friend who I travelling with is an ASL interpreter, and she had come across an article about this new place just before trip. Unfortunately it turned out that the opening of the restaurant was delayed. It started its operations a week later than initially planned which was a few days after we were in town. Next time! I have probably never in my life been as hungry as on Monday morning after the race. No wonder: The race was worth some 5000 kcal on top of the standard daily 2000 kcal. To compensate for the minus calories, we had a tasty 3-course lunch with 100% guilt-free dessert at one of the restaurants participating at the Summerlicious food festival. Still, it was only after inhaling a $10 bar meal consisting of a huge burger, a mountain of French fries, and a massive pint of beer at the Urban House Cafe in the evening that my body felt relieved and full. Good value! The dinner gave just enough energy to sample a few local beers at the neighboring Bar Volo where we randomly ended up joining the birthday party of a local girl. 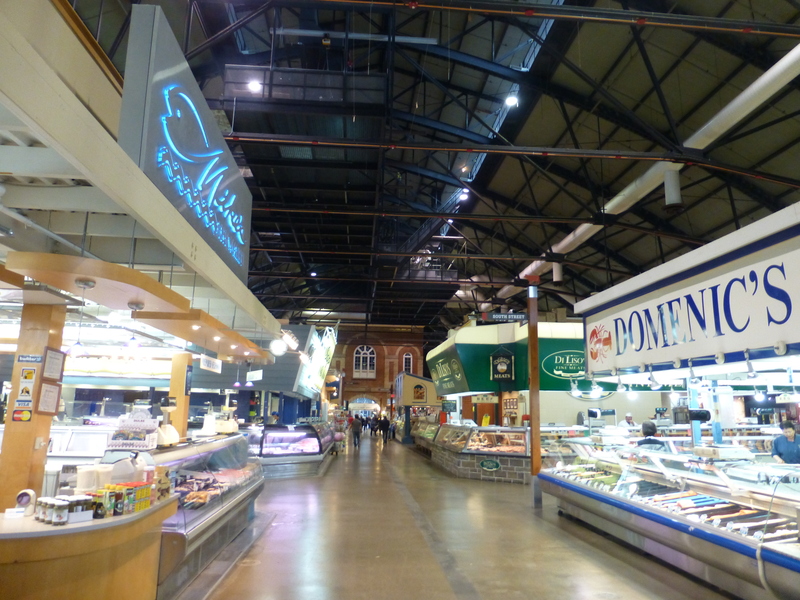 On Tuesday we had a yummy start to the day at the awesome St. Lawrence Market. Everything from gooseberries and Greek pastries to vegan raw juices tasted so good! Then we were already forced to leave Toronto behind and start the long drive back to DC via Niagara Falls. My expectations for Niagara Falls very not particularly high as I had heard horror stories of the notorious Las Vegas style infrastructure, atmosphere and mass tourism in the area. Furthermore, despite the healing refueling at the market I was actually feeling pretty horrible after the race: in addition to being tired and sore, I could feel my cold was coming back. 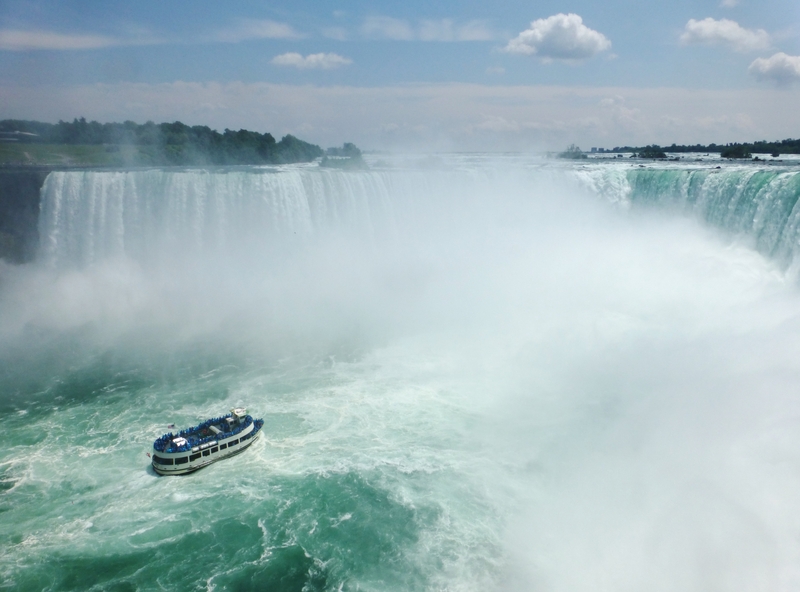 Considering all this, the Niagara Falls visit was definitely a huge positive surprise. The weather was pretty, and the waterfalls were absolutely stunning both from the Canadian and the US side of the border. The best part was a cruise with the Maid of the Mist, a boat that took as right by the falls. Getting completely wet was an excellent way to truly wake up and feel refreshed at least momentarily. The drive from Niagara Falls to DC was long and grueling. I had managed to omit the fact that summer nights in Pennsylvania and Maryland are all but white like in Finland. November-like darkness hits early! This meant hours of driving on the pitch dark roads. Somehow magically my friend still managed to pull it off and drive us back safely. When I finally got home during the night between Tuesday and Wednesday, I was ready to collapse to my bed. On the following day, I did not leave the house at all. I still felt pretty destroyed, but at the same time I felt like a winner. PS. Up until several weeks after the race I thought it was an urban legend – or a rural legend – that there was a tornado on the race day. When I finally did a little googling, I found some actual evidence: a tornado indeed hit the other end of the lake on the morning of the race day. Now that explains the waves and the wind. The weather conditions (4’C/40’F, storm wind and nonstop rain) of the Stockholm Marathon in June 2012 were legendary to say the least, but Musselman 2014 is a serious competitor for the craziest conditions ever. Seriously, a tornado! After The Head and the Heart saved my day in March after one of the most challenging half marathons of my life, I was determined to see them live soon again. When I spotted them in the line-up of the (free!) 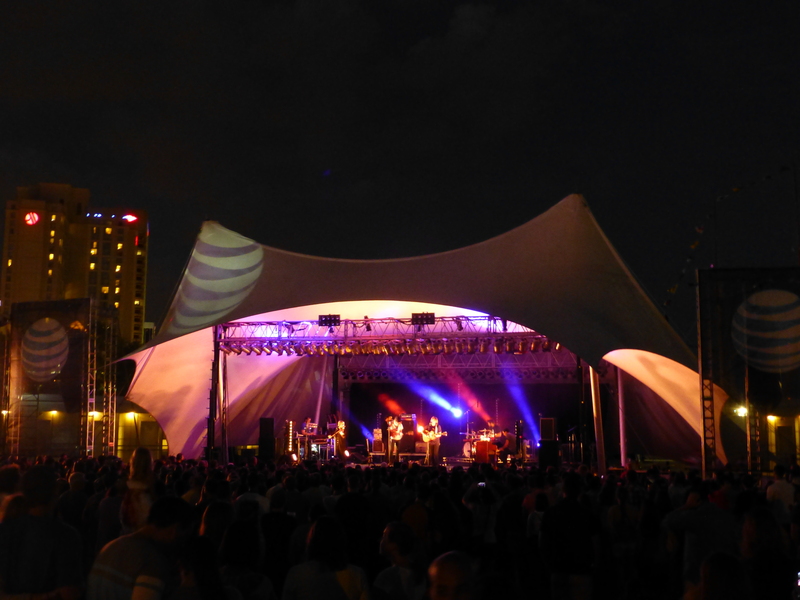 Norfolk Harborfest in Virginia, I decided to use their concert as a perfect excuse to plan a weekend road trip to Virginia – or use the road trip as an excuse to get to the gig. This time I managed to recruit a “partner in crime” over lunch at the World Bank. As I was well aware of the notorious reputation of I-95, we started our drive early on Friday afternoon. The drive time without traffic should take around 3 hours, so I assumed that the early start at 1:30PM should help us to get to Norfolk in 4-4.5 hours. That’s not exactly what happened. There were at least four accidents on the highway making the traffic jams exceptionally bad even for a Friday. Eventually we made it to our hotel in about 6.5 hours, parked the car, rushed to check-in, tossed our bags into the room, hopped on a cab, and made it to the festival grounds at 8:35PM. The band had just started so we did not miss more than half a song. What an amazing race! And what a lovely concert! The music and the dark warm summer night by the water were a perfect combination. On Saturday morning, our first “sight” was Walmart. My friend had never been to one, so I wanted her to experience this essential part of America. Slightly disappointingly, we did not come across any very strange people this time, but at least we were able to stock up the car with snacks. The drive up from Norfolk to Virginia’s Eastern Shore and eventually to the Chincoteague Island was super scenic. The 50 year-old Chesapeake Bay Bridge-Tunnel was definitely one of the highlights of the day. 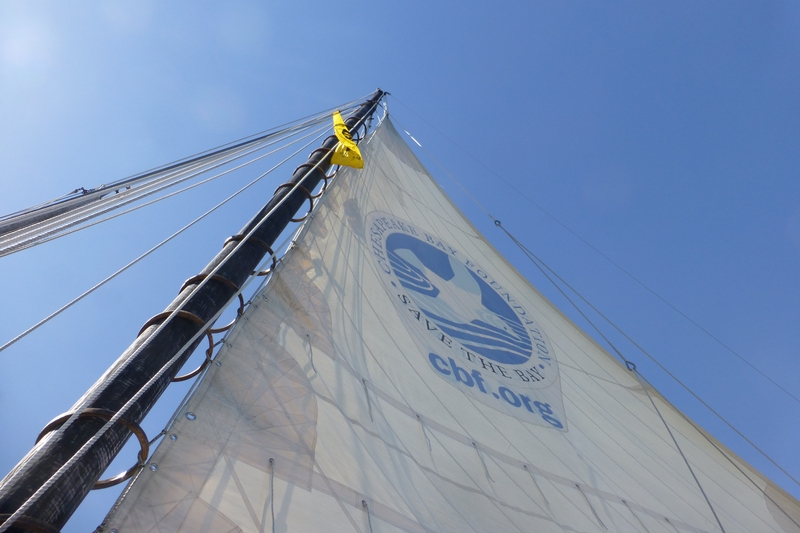 This 20-mile / 32km long “engineering wonder of the modern world” took us over and under open waters exactly where the Chesapeake Bay meets the Atlantic Ocean. 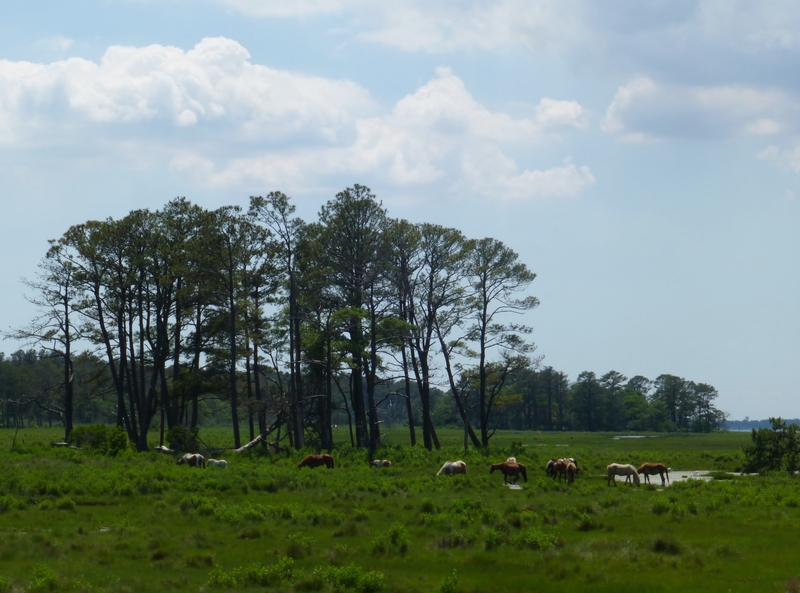 The Chincoteague Island is most famous for Chincoteague ponies, also known as Assateague horses. The latter makes much more sense as these wild horses actually live on the neighboring Assateague Island. The ponies have lived on the island some 400 years, and no one knows for sure how they ended up there. The main theories are that either they were brought by early settlers or that they are shipwreck survivors. Before heading to Chincoteague, multiple people did their best to manage my expectations and warned me that we might not see a glimpse of the ponies as they often hide in more remote parts of the island. Hence, we can consider ourselves lucky as we spotted a herd of these small, shaggy creatures right after getting on the island. 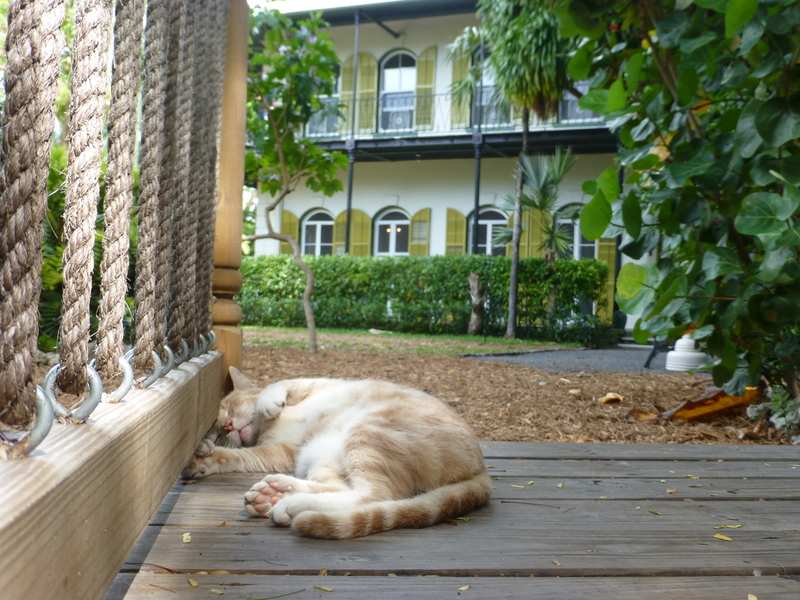 In addition to the bridge and ponies, Saturday highlights revolved around food and taking it easy. For lunch, we had delicious fish tacos at Bill’s Seafood Restaurant. Then we spent a couple of hours on the beach on the Assateague Island. On the way back from Assateague we stopped for ice cream at the legendary Island Creamery. In the evening we had a Vietnamese takeout on our patio. 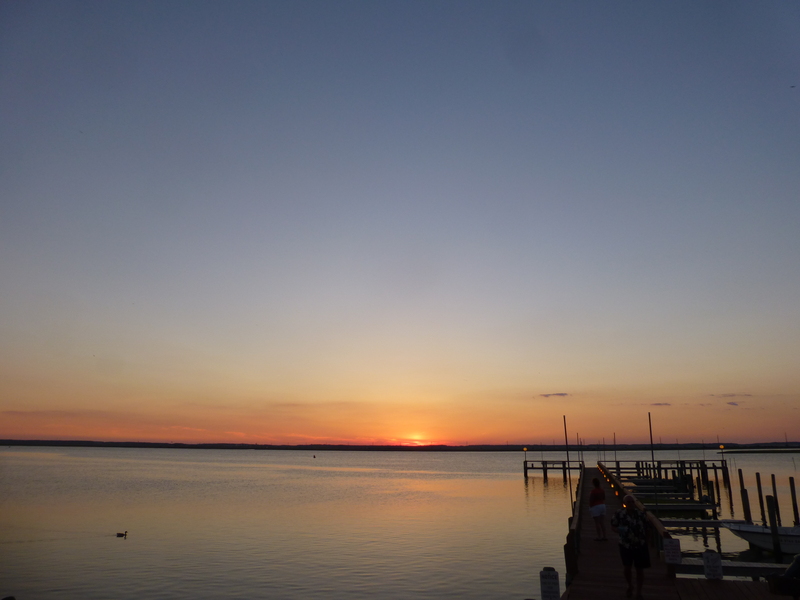 Our hotel Waterside Inn was perfectly located for admiring one of the famous Chincoteague sunsets, and excellent for star-gazing, too. The combination of sea, stars and silence reminded me of Coromandel peninsula in New Zealand, one of my all-time favorite places. I think I can add Chincoteague to the same list. 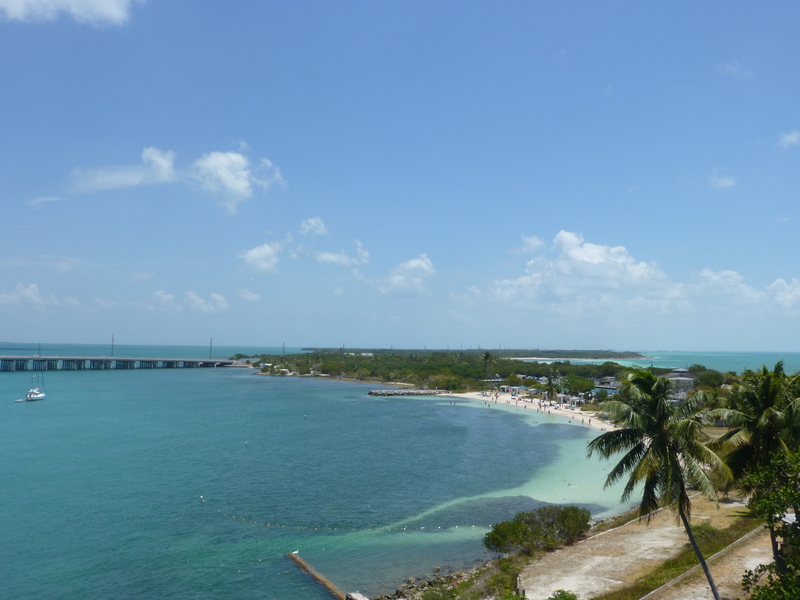 Trying not to neglect my triathlon training on the road trip entirely, I started the Sunday morning with a 10-mile run around the two islands. It was pretty hot already before 8AM. Not long ago I would have whined about this, but now I just perceived it as an excellent opportunity to practise running in heat and test how my body reacts to salt tablets. 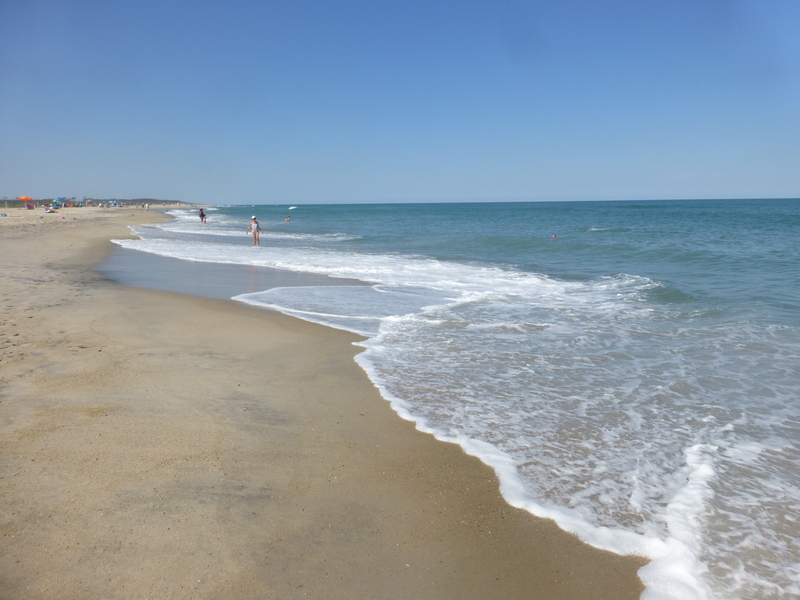 The other highlights of Sunday included returning to the beach on the Assateague Island once more and swimming in the Atlantic, climbing to the Assateague light house, and having a “gourmet carry-out” lunch (gazpacho and a huge sandwich) at the Sea Star Cafe. Driving back from Chincoteague to DC through Maryland was fortunately not as slow as getting to Norfolk. 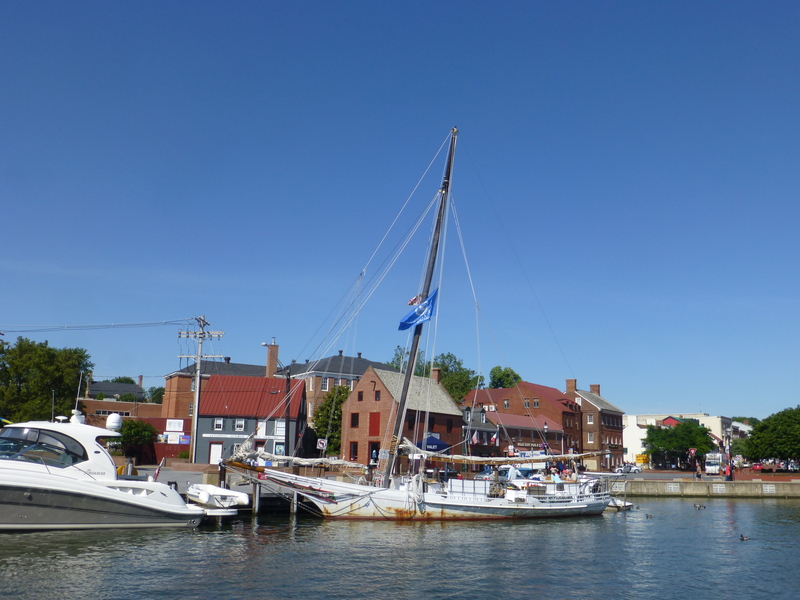 This time we crossed the Chesapeake Bay over another gigantic bridge close to Annapolis where we stopped for an ice cream break at Storm Bros and to pick up another World Bank friend who needed a ride back to DC. Check out additional Virginia road trip photos on Flickr. Celebrating midsummer (juhannus in Finnish) is more or less as important for Finns as Thanksgiving is for Americans. In a country far north with long dark winters, the summer solstice is an important milestone, as after it days are getting shorter again. Maybe that is why Finns take this celebration of summer and light very seriously. I know I am all but objective, but I can’t help finding it more logical to refer to the occasion as midsummer rather than the first day of summer, like it is called in the US. The most typical way to celebrate midsummer in Finland is to gather with friends or relatives to someone’s summer cottage (mökki) and spend up to four days by a lake. The main activities are eating, drinking, and having sauna, and maybe lighting a big bonfire (kokko). Most of my midsummers have followed this exact formula, but this was not the first midsummer that I would spent abroad. Ten years ago when I lived in Brussels, we had a very authentic and successful midsummer simulation. Those fond memories inspired me to do my best to create midsummer spirit in DC. As sauna is a cornerstone of Finnish midsummer traditions, living in a house that has one put me to an excellent position to host a midsummer party. The trickier part was how to get a vihta (also known as vasta), a bunch of birch branches used to gently whip yourself or each other in the sauna to relax muscles, stimulate the skin, and enhance blood circulation. (I must admit this may sound pretty weird or even violent, but it is simply great.) First I considered asking someone to send me a frozen vihta from Helsinki or heading to a nearby park in the dark to collect a few branches. A friend of mine even offered to check out the local offering on her business trip to Moscow, but as we did not want to take any chances, we continued scheming. Then we found out that it is possible to order one on Amazon! Who would’ve thought? I placed an order immediately. 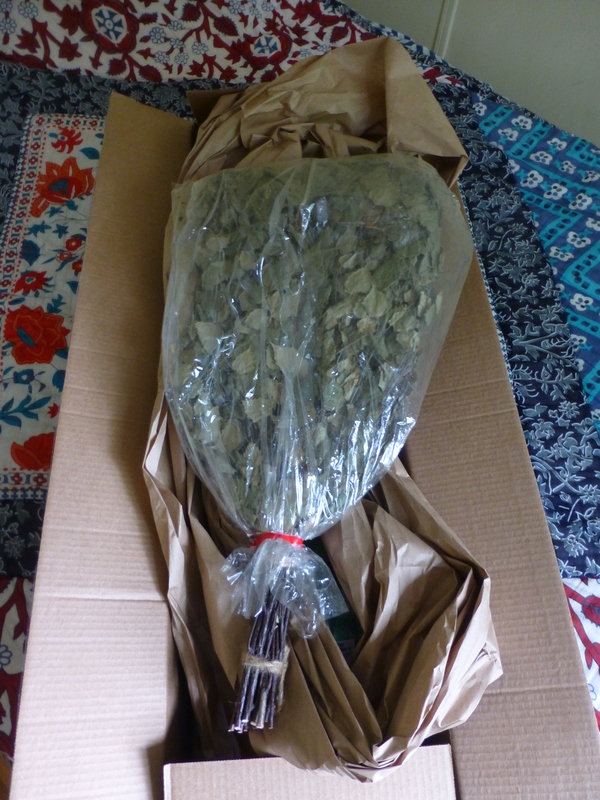 When the mailman brought a big parcel a few days before midsummer, a big smile spread across my face. In Finland, the first potatoes of the new season are typically available just before midsummer, so it would be hard to find a midsummer party where people would not be happily munching boiled new potatoes. DC is so much further south that here the potato season is obviously starts much earlier and is much longer. I decided try my luck at a couple of nearby farmers’ markets anyway to see if they had anything comparable available. No potato luck at the Adams Morgan Farmers’ Market, but I did find excellent rye bread (Russian style, not Finnish, but still). My next destination was the Mt. Pleasant farmers’ market. When I saw boxes full of nice small round fresh dug potatoes, it was time for another big smile. 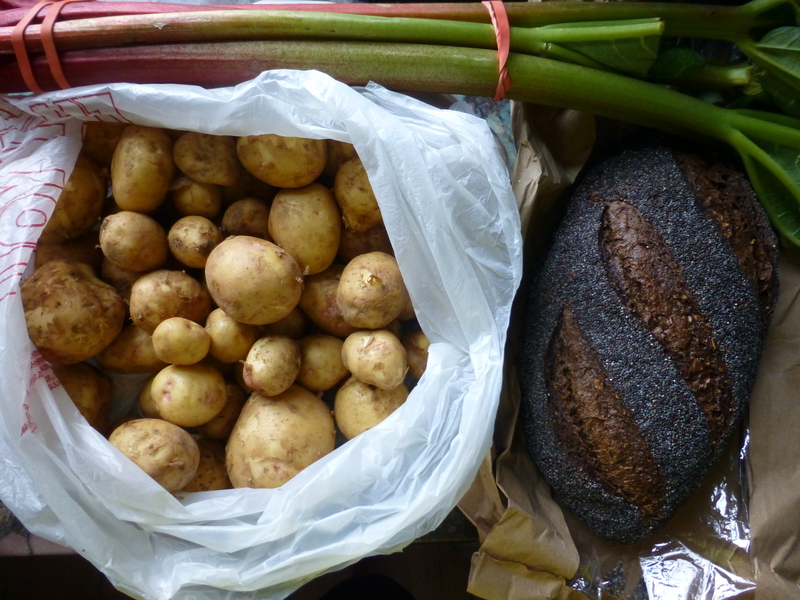 Even after bargaining, these were probably the most expensive potatoes of my life, but definitely worth every penny. As a bonus, I found fresh rhubarb as well. Having secured the birch branches and new potatoes, I knew the evening would be a success. And it was! I loved having our house and patio full of friends. I was of course super late with my slightly too ambitious cooking plans, including making rhubarb soup and Finnish pancake, but that did not matter at all as the kitchen was immediately full of helping hands. The atmosphere could not have been more authentic, so casual and relaxed. It felt like people had known each other for a long time, although many of them met only in the party (or in the sauna). In the end, nearly 30 people joined the fun, mainly Finnish and American and a few brave representatives of other countries. All the Finns loved the sauna, and so did most foreigners, even the beating with the birch branches. Participating to Peasantman was not only consequence of bumping into a friend a mine at the pool in spring. There was a raffle at the Peasantman race packet pickup happy hour, and I happened to win a one-day participation to an event that I would have otherwise probably never heard of, Bike Virginia. 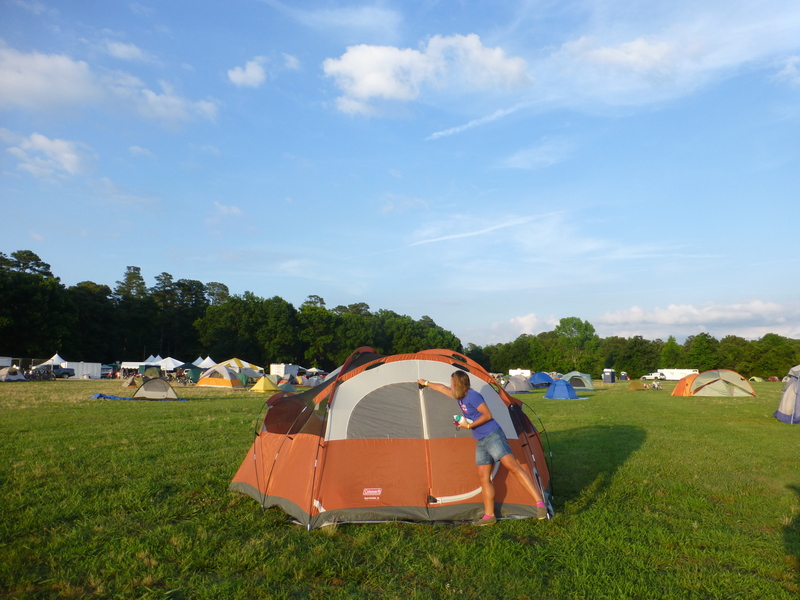 It is a six-day-long bike tour in a different part of Virginia each year. Participants can choose between multiple route options varying between 14-100 miles in distance. The routes are fully supported with drinks, food, and special treats. This year the event took place near Williamsburg, and there were some 1,500 participants. Again I was lucky to find a friend who was interested in the event, this time a fellow triathlete. We signed up for one of the days pretty randomly. We had signed up for the event before my knee issues started on our Memorial Day bike tour. I had done only one longer ride after the tour. On that ride I started to feel some pain after about 30 miles / 50km, so I had been resting the knee since then. I had no idea how biking 68 miles / 110km would feel, and how smart biking would be. Following the advice of two of my midsummer guests (a Finnish nurse and a Finnish physician), the day before Bike Virginia I got my knee KT taped at Rose Physical Therapy by Claire who was so kind that she promised to help me out with a short notice between her other customers. With a nice pink strip of tape on my right knee, I hopped on a train with my bike and camping gear that Monday night and made my way to Alexandria. We had agreed that I would stay over at my friend’s place to make our super early start more doable. On the train I could tell right away that an old man sitting close to me showed a special interest towards my bike. A few stations later he dared to open the discussion. It turned out that this grandpa was from Colombia, an avid cyclist himself, and from the same village as one of the future Tour de France talents (Giro d’Italia winner Nairo Quintana, I assume). For some reason he totally loved my Focus Culebro. He even complimented the design of the seat. What a great start for the Bike Virginia adventure! The best crab cakes of my life cooked by friend’s boyfriend made the evening still more glorious. On Tuesday morning we had to get on the notorious I-95 again, this time already 5AM. We managed to get out of DC before the morning rush hour and made it to the Bike Virginia based camp, the Chickahominy camp site in a few hours. The weather was beautiful when we got on our bikes around 9AM. I felt almost cheating being on a road bike with clip-in pedals as my friend did the whole ride with her hybrid and running shoes. The benefit of this asymmetry was that for me the pace would be very relaxed, meaning less work for my sore knee. This was also the first time that I had a cadence meter, so I could practise maintaining a super high cadence. Crossing the James River via ferry was a fun way to start and end the day. The ferry was very similar to the ones I had taken on a bike tour in Turku archipelago in Finland, so I felt immediately like home. Whereas in Turku archipelago we were biking in the middle of wheat and canola fields, here we were surrounded by endless corn fields. After my friend told me about a horror film where aliens are hiding in the corn fields, I spent the rest of the day trying to spot one. There were three rest stops along the route serving everything from PB&J sandwiches and animal crackers to baked potatoes and ice cream floats. Being able to indulge in all kinds of treats during the ride is a big plus for biking compared to running! Despite the high number of participants, the crowd was so spread out that we mainly saw other bikers at the rest stops and on the ferry. Whenever we chatted with anyone, my accent triggered the usual questions, and I happily shared my Fulbright elevator speech over and over again. My knee behaved well the first 60 miles, but after that it got pretty painful again. The comforting fact was that the Half Ironman bike ride is only 56 miles, so that would have been fine. Once we were done with the pedaling for the day, even with the last painful miles, we got our second ice cream serving of the day. After having a blissful shower, it was time to set up our tent. I’m pretty sure that two of us had the biggest and fanciest tent of the entire campsite, so this was not only my first time of car camping, but also my first time glamping! I slept super well in the fancy tent. Spending the whole day on the bike and having a brief but fabulous massage after dinner probably contributed to that as well. On the following day, my friend made sure that my visit to the Virginia countryside would be as complete and educational as possible by taking me to the Colonial Williamsburg first and then to Cracker Barrel for lunch. 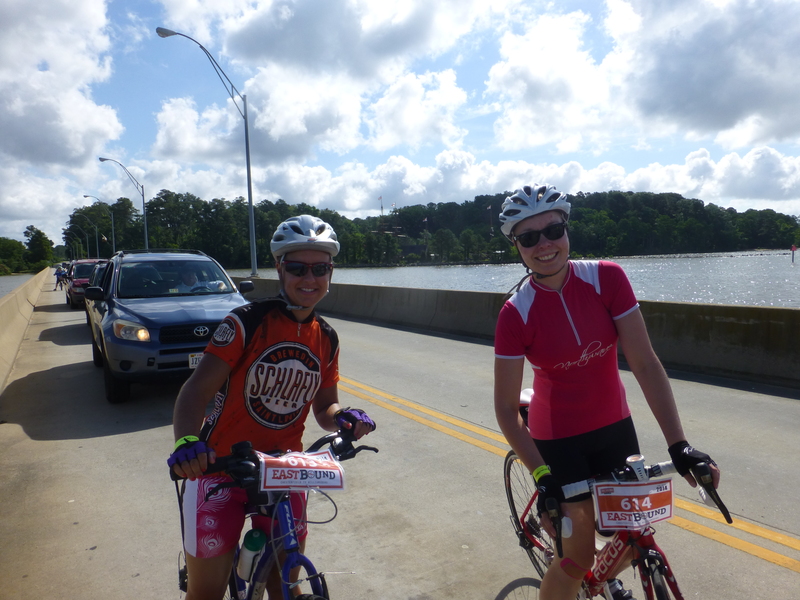 Check out additional Bike Virginia photos on Flickr. I bet most of you are familiar with TED talks and have seen videos of e.g. Steve Jobs, Hans Rosling, or Susan Cain presenting their ‘ideas worth spreading’. So had I, but I had never had the opportunity attend a TED seminar in person before this April. 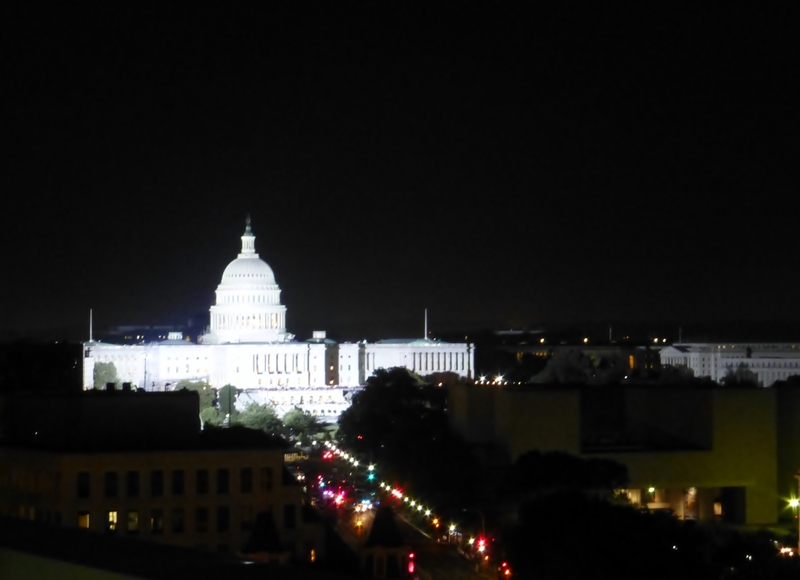 TEDxFulbright, an independently organized Ted event, took place here in DC at the beginning of the month. The day of the event happened to be one of the first sunny Saturdays of the spring, so it felt like a huge investment to spend the day indoors. Luckily, it was worth it. I had no idea how much one can learn just by listening to inspiring speakers in just one day. The speakers shared their stories of how they had dared to start to tackle social, societal, and environmental problems around the world. The tsunami of topics covered everything from carbon capture, open data, and drones to empowering street kids by teaching them ballet. All the speakers and performers were Fulbright alumni. It was incredible to see the amount of talent and geographic reach that the community has. 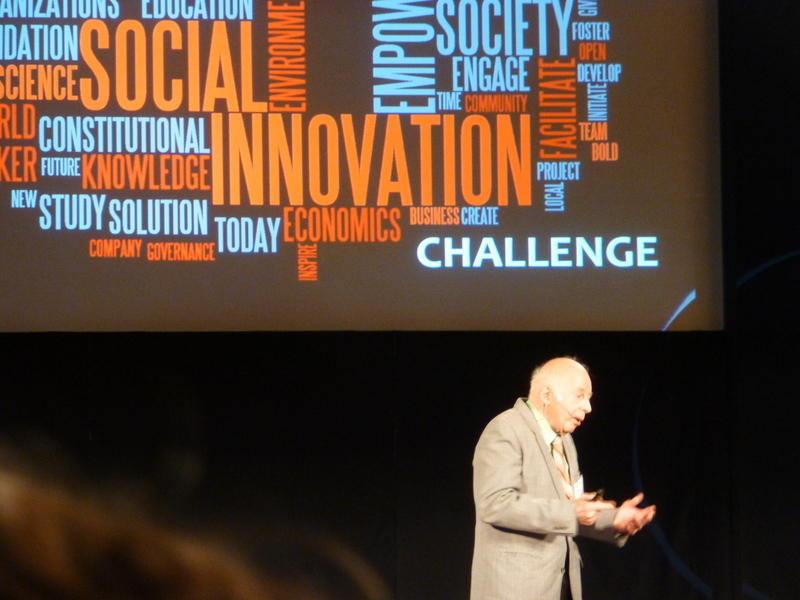 The finals of the Fulbright Social Innovation Challenge were also a part of the event. One of the finalists pitched over Skype from Lahore, Pakistan. I thought that was quite cool, but it was maybe even more memorable to see a grandpa pitching. My favorite finalist, a facilitated hitch-hiking service Lawrence OnBoard, did not get too many votes from the audience, but I definitely plan to stay tuned to how their story continues. After eight intense hours, the event ended with a champagne and cookie reception and further cross-cultural mingling. Just another day in the life of a Fulbrighter? I could not have been happier in April when even Americans started to consider the weather to be nice enough for all kinds of outdoor activities. 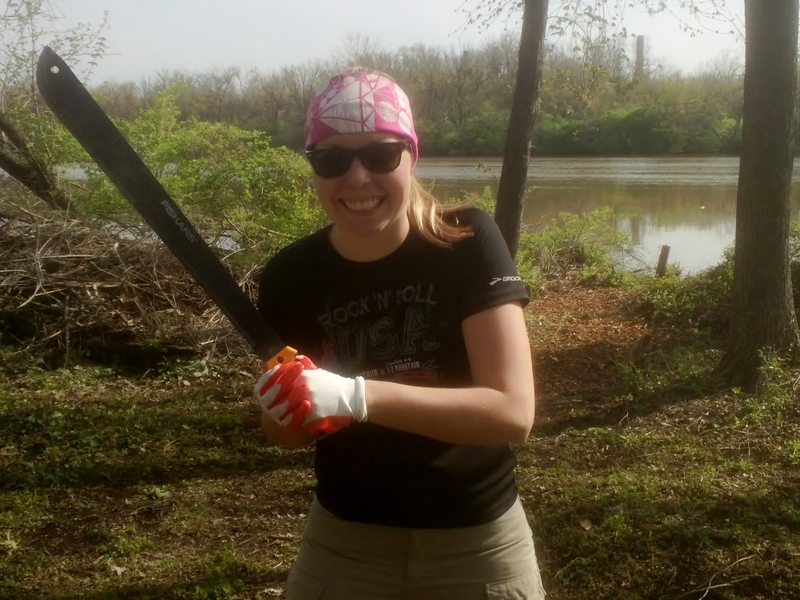 One of the highlights of the month was volunteering with REI to clean up Kingman Island and prepare it for Kingman Island Bluegrass Festival. I was pleasantly surprised to see that there really was a lot to do for 100+ volunteers, even some serious pruning. Mom would have been proud, had she seen me using my raking and weeding skills developed as a child. And it was a proud moment for a Finn to see Fiskars garden tools in action. Once again, I also learned something new: Fiskars produces machetes! Finally, I should mention that all the volunteers – obviously – got a free T-shirt. Another great outdoorsy experience was the first hike of my Fulbright year. A friend of mine is a member of the Wanderbirds Hiking Club that organizes weekly hikes. Early on a Sunday morning, we hopped on a bus full of sweet old ladies and gentlemen. The bus dropped us of somewhere in Maryland, and we started our beautiful day hike along the Catoctin Trail to Gambrill State Park. The Wanderbirds concept is brilliant: The leader of the hike leads the group and leaves red arrows to otherwise potentially tricky turns and crossings. Hikers can either hike with the leader, or at their own pace, like we did. Another experienced club member is a designated sweep whose task is to be the last one to make sure that no one is left behind and to collect the red arrows. This makes hiking safe and accessible for a wide audience, regardless of previous hiking experience. When it comes to food, Finns living abroad typically miss most rye bread, our national obsession. I’m not an exception. The only equivalent in the US market is rye bread made by Nordic Breads in Long Island City, NY. Their products unfortunately can’t be bought in grocery stores outside NYC. 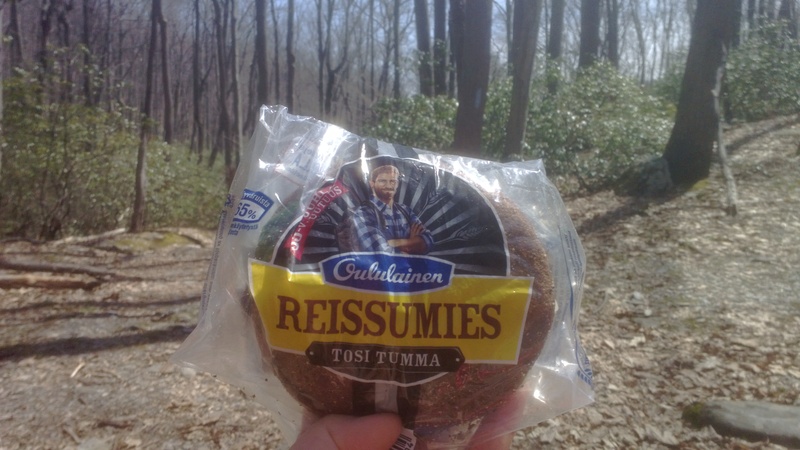 Thanks to my recent Finnish visitor, I happened to have my favorite snack available for the hike: Reissumies. If you ask me, nothing beats the taste of fresh rye bread enjoyed in a scenic spot and with great company. We spent about a little below four hours on the 10 mile / 16km trail. I loved every moment in the quiet and peaceful forest! After the hike, the group gathered by the bus and hung out for a while sipping recovery beers, eating chips, and chatting. 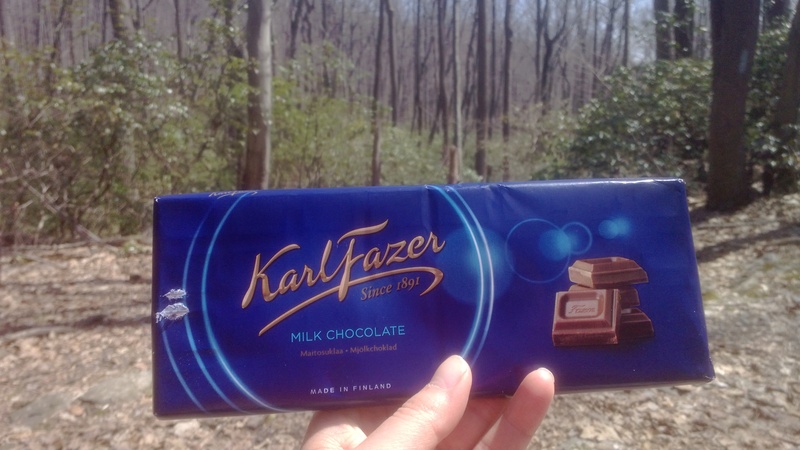 I made lots of new friends with my secret weapon, Finnish chocolate by Fazer, hand-carried to me by another awesome Finnish friend. This icebreaker even triggered one of the hiker ladies to share that she had been on a business trip in Finland in the 70s when she worked for CIA in Paris. Americans love not only free T-shirst, but also their sports. Before coming here, I was pretty familiar with NHL, NBA, and NFL. My knowledge of Major League Baseball, MLB, was very close to zero, although our national sport is actually also called baseball, pesäpallo. That’s why I was delighted to be able to go to my very first MLB game as a part of the Fulbright Enrichment Program. Mike summarized for us everything from the history of the game to rules, roles, and tactics. The way he illustrated his key points on a whiteboard made me think of an ice hockey coach. One of my key take-aways was that the role of the pitcher is far more important in American baseball than in the Finnish version. Our pitcher does not even have a pitchers mound! The shape of the field and locations of the bases are also somewhat different. Otherwise there are lots of similarities in the logic of American and Finnish baseball. That made learning the main rules relatively easy for me. For many, even the idea that the defending team always has the ball may be completely foreign. After the thorough briefing, it was time to head to the Nationals Park. It was fun to see all the theory in practise right away. 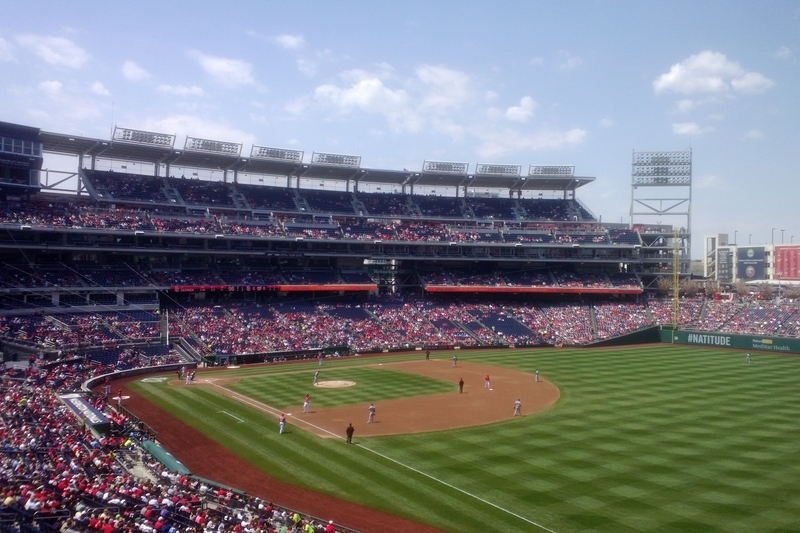 Washington Nationals seemed to completely dominate the game since the beginning. They ended up winning San Diego Padres 4-0. I leave summarizing the game in more details for someone more professional. Mercifully for us first timers, the game was exceptionally short, only 2 hours and 19 minutes. The average lenght of a Major League Baseball game is around 3 hours, but they can last up to 7 hours. Bike to Work Day was a big deal in DC today. Unfortunately torrential rain in the morning messed up the plans of some of the nearly 17,000 registered participants, but many did not let that matter. 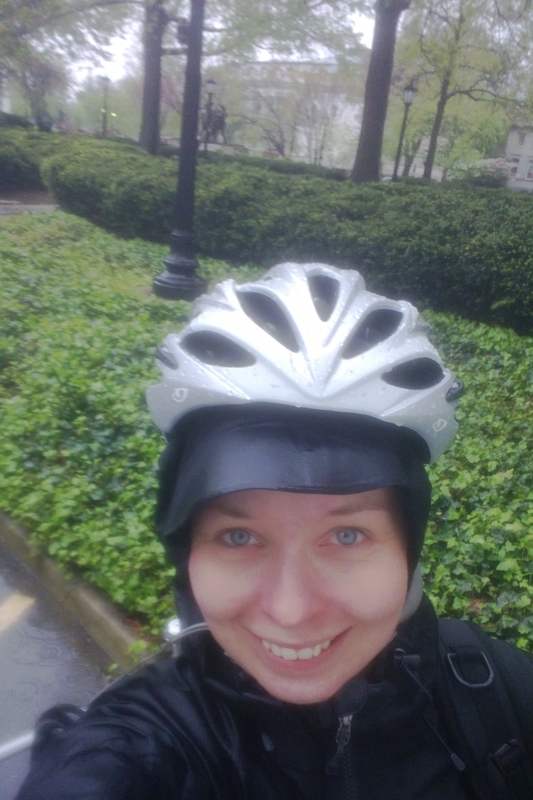 I was lucky to be able to head to the office only when the rain had almost stopped, and I still made it to a Bike to Work Day pitstop at the National Geographic Society. I got some free breakfast and swag, and – of course – a free T-shirt. Americans love free T-shirts. As I commute by bike daily, for me a bigger deal than Bike to Work Day was my very own invention, Bike to Vote Day. Another five years have passed, and it’s time for the European Parliament Elections. Finland will elect thirteen members to the European Parliament. The elections in Finland will take place on May 25, but the advance voting has already started and lasts until May 20. Outside Finland, the last voting day is already May 17, so especially Finnish friends living abroad, hurry up! Luckily if not surprisingly, the Embassy of Finland here in DC is a voting location. That’s where I headed with two Finnish friends to cast our votes. No waiting in line, a very fast and efficient procedure, just like you would expect from us Finns, I guess. Finns in DC can still vote tomorrow on Saturday from 10AM to 2PM. The Embassy of Finland is the first embassy in the United States to be certified as an energy efficient building. Bike parking was provided for Bike to Vote Day participants. Yet another reason to brag about our green embassy. In 2004 I lived in Belgium and voted at the Embassy of Finland in Brussels, so this starts to feel like a nice tradition. Any wild guesses where I might find myself in 2024? 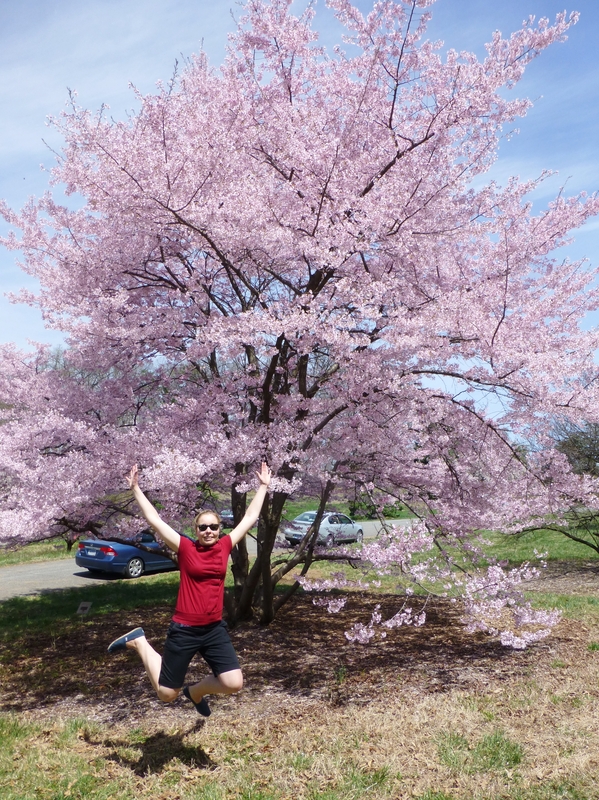 Having been a hanami enthusiast in Finland and elsewhere for years, I could not have been happier to learn that the cherry blossom is a big deal in DC. The tradition dates back to 1912, when Japan gave 3,000 cherry trees as a gift to the United States to celebrate the nations’ friendship. Another 3,800 trees were donated in 1965. 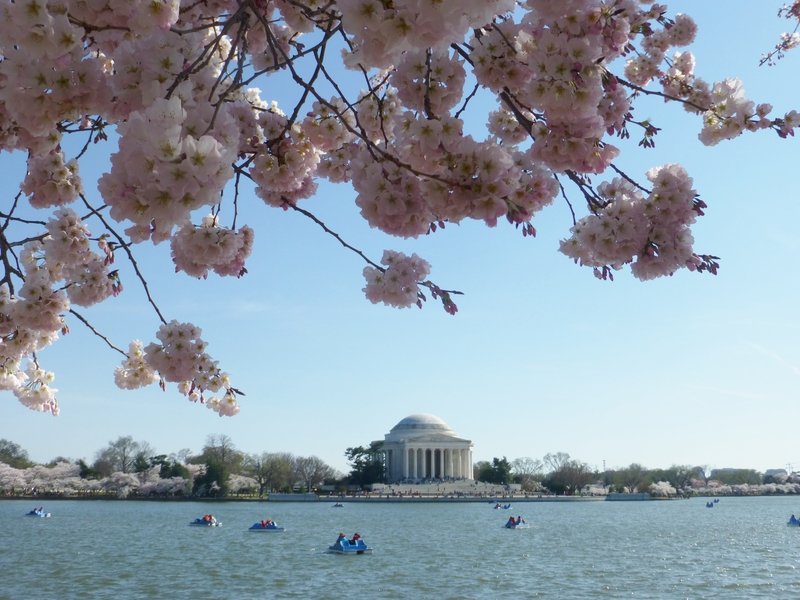 These trees were planted around the Tidal Basin, East Potomac Park, and on the grounds of the Washington Monument. Each spring, over a million people come to see them bloom. There was still snow on the ground when I familiarized myself with the bloom statistics and started to check the bloom forecast almost daily. 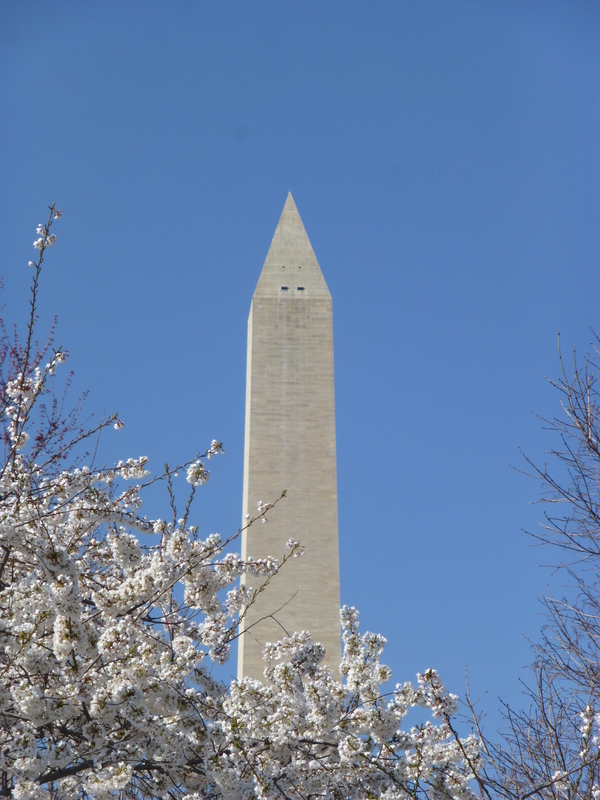 After weeks of waiting, the peak bloom occurred this year on April 10, only 11 days after the last snowfall! During the past 30 years the peak bloom has occured this late only twice. The record is from 1958, though, when the peak bloom happened only on April 18. 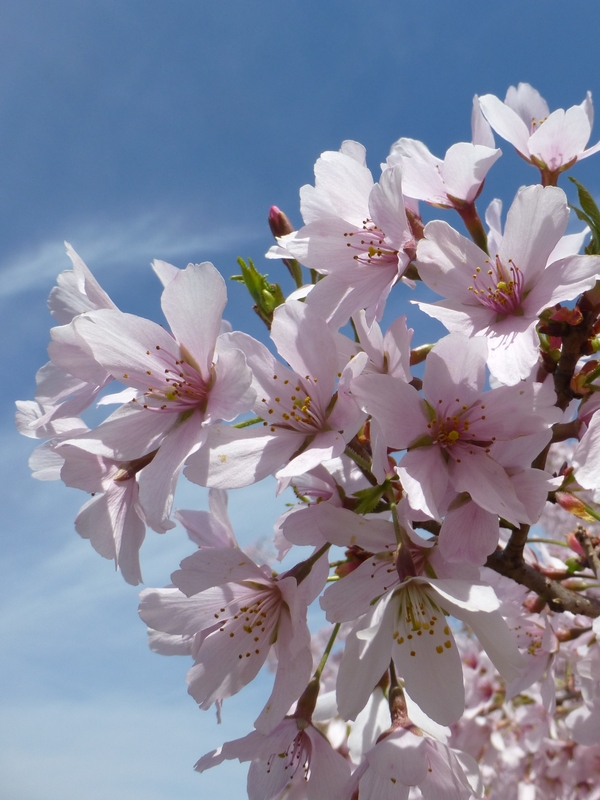 The earliest peak bloom was on March 15, 1990. 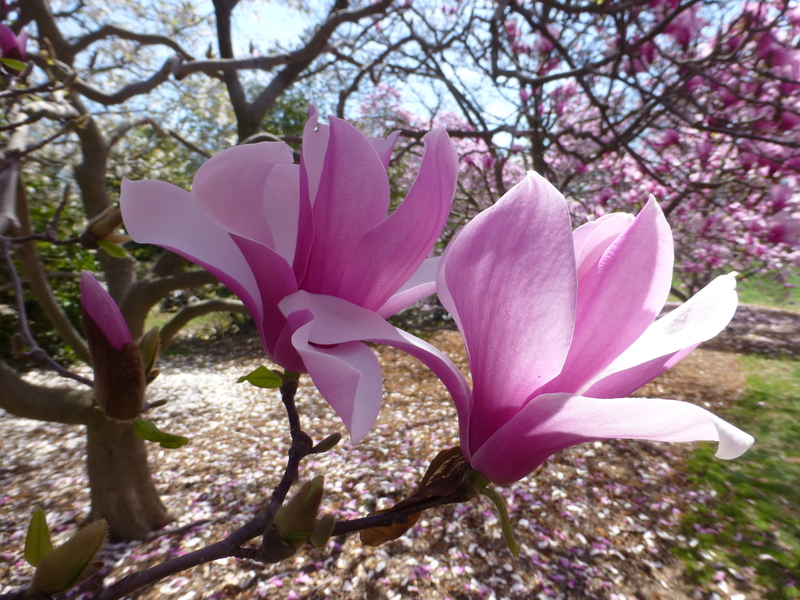 Like the hawk-eyed readers surely noticed, the last photo is actually of magnolias. For some reason the magnolia blossom is not as famous as the cherry blossom, but if you ask me, that is pretty sweet, too. After five days of summery weather, it was raining heavily and it was (literally) freezing cold on Tuesday. Now the sun is back, but the city is green rather than pink all of a sudden, as most of the petals are on the ground. This is a classic example of how quickly the bloom can be over, and exactly the reason why the “luminous and beautiful yet fleeting and ephemeral” cherry blossom has become a metaphor for life itself. Make the most out of it while it lasts! Sometimes it is pretty handy to have a sister who lives on the West Coast. For example, when you need to come up with an excuse to travel to the Rockies. That’s how I made it back to Colorado after almost seven years – to literally meet her halfway. My previous visit was a quick pitstop in Vail (with an epic dump) on my way from Phoenix to Helsinki in 2007. This time we stayed in Breckenridge for an entire relaxing week. 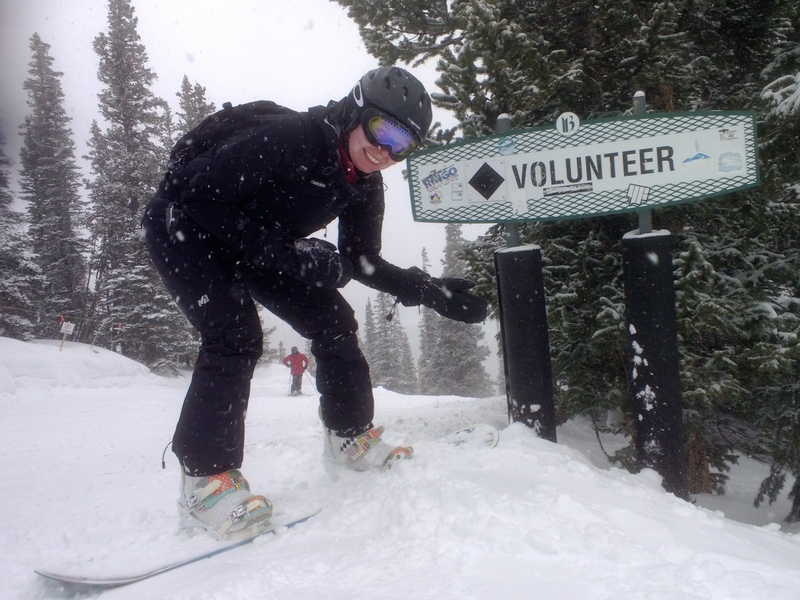 The daily routine consisted of snowboarding, dining, studying snow forecasts, and sleeping. Early to bed, early to rise. Good times, crowned with having sauna three times. The most typical lodging option in Vail and Breckenridge are ridiculously priced millionaire lifestyle hotels. Luckily, my sister had insider information of a real gem: The Fireside Inn, the coziest B&B one can imagine. This cute light blue wooden house was a perfect basecamp for us with pleasant English owners who seemed to understand our Finnish humor, a hottub, and – wait for it – free cake après-ski daily at 4pm! Highly recommended. Another hot tip is that lift tickets are somewhat more affordable (yet still expensive) when bought in advance online. Before this trip, I had never gone cross country skiing in the US or above 3km / 9,000 feet. When I realized that this is possible in Breckenridge, I became obsessed enough to sell the idea to my sister. So one fine afternoon we headed to the Breckenridge Nordic Center to rent skis and hit the trails. Seeing the Finnish flag outside the reception building inspired me to try to negotiate a special rate for Finns (as for a Finn it is unheard to pay for the access to cross country trails). A discount did not work out, but revealing our roots nearly turned us into celebrities. The most legendary part of our ski tour was encountering a moose on our way back. 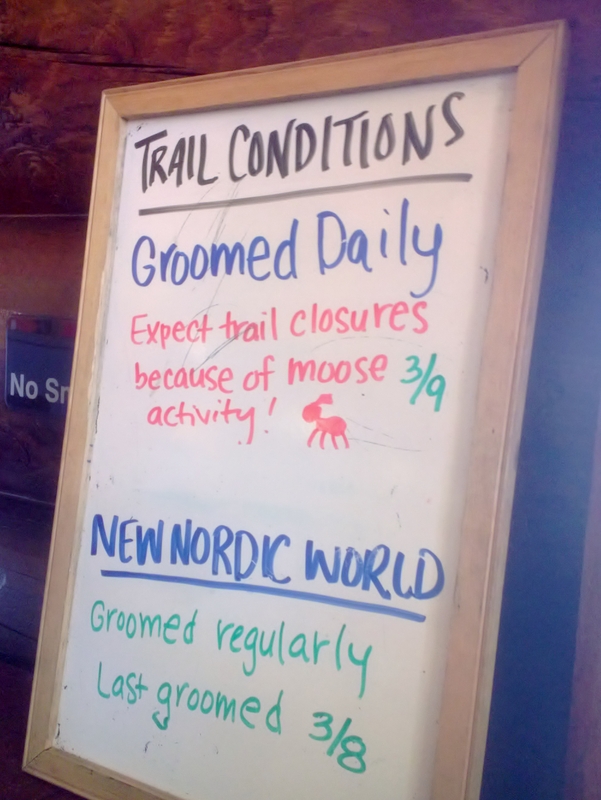 We had seen a moose activity warning at the reception, but at that point it had felt more like a joke. However, when all of a sudden a gigantic moose was blocking our way, it was not quite as funny any longer. The moose are apparently so used to people in Breckenridge that they do not run away when someone approaches them – like any sane moose would do back home. This one was happily chewing branches and showing no signs of plans to disappear back to the forest. Hence, we were left with no other options than to turn back and take an alternative trail, albeit partially so steep and icy that we had to take the skis off. This still seemed like a more appealing option than trying to get around the moose through the thick bushes. 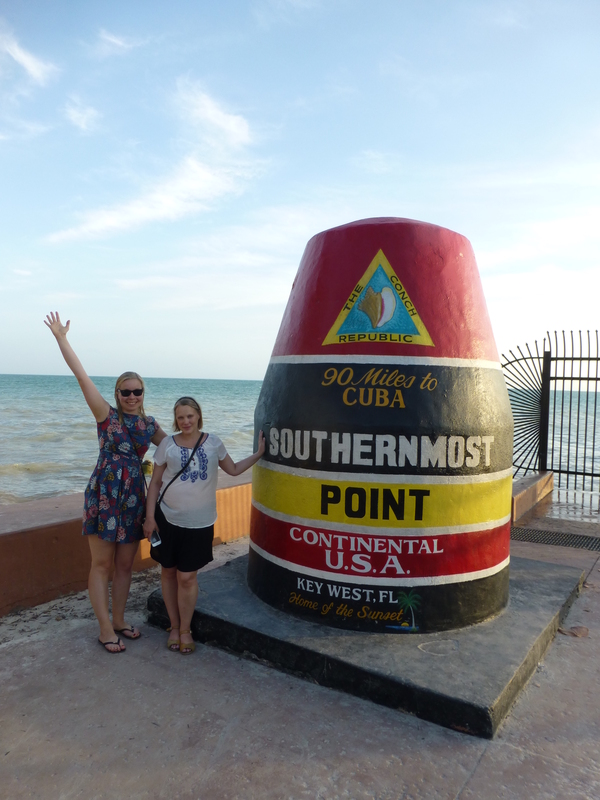 A little bit of extra adventure for the famous Finnish sisters. Another unforgettable episode was one of the numerous brief conversations we had on the chair lifts. The usual small talk topics were the snow conditions (of course) and what brought the two of us to the US. However, when an old man heard we are from Finland, he taught us an interesting piece of trivia: The American ski industry exists thanks to Finnish ski troopers! As the story goes, the U.S. Army established their winter warfare trained troops inspired by the victories of the Finnish soldiers on the skis over Russia in 1939. These troops fought in Italy later on in WWII. After the war, many of the veterans became ski instructors or contributed in other ways to the development of skiing as a vacation industry. To me this all sounded truly unbelievable, but Wikipedia confirms that the old man knew what he was talking about. 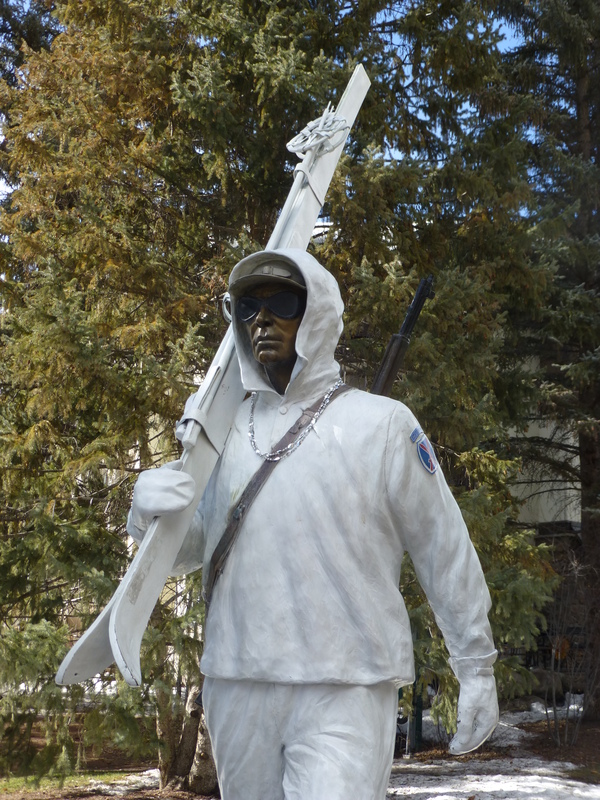 On our last day we also spotted a statue in Vail commemorating the American ski troopers. Check out additional Colorado photos on Flickr. It had been quite a while since I last woke up at 5am to have breakfast and get ready for a race. That’s what I did on March 15 to participate in the Rock ‘n’ Roll USA Half Marathon. The walk to the Columbia Heights metro was quite surreal that early on a Saturday morning. It was still dark, and it was very silent on the streets. Most people out on the streets were there for the very same reason. The metro was full of runners, all heading towards the start line on the Constitution Avenue. Just before the race started at 7:30am, the sun came up and the national anthem quieted the crowd of 25,000 runners. I think I will remember that touching moment for a long time. A nice brisk morning, anticipation of the race, and so many silent Americans. Luckily, the best part awaited after the finish line. It was not the first aid guy who came to ask if I was ok when I was feeling sick right after crossing the finish line… Nor was it the free chocolate milk, or the free pretzels, or the free beer… It was a stunning post race finish line surprise concert by my latest favorite band The Head and the Heart! 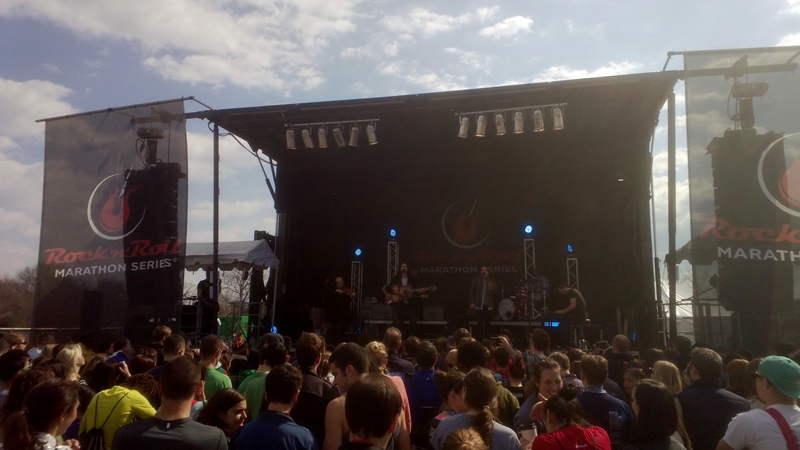 Somehow I had managed to entirely miss the fact that a finish line concert is an integral part of the Rock ‘n’ Roll running event concept. Had I completed the half marathon in 2 hours (like I was dreaming when signing up last fall), I probably would have been showering at home by the time the concert started. In this country, anything can be turned into a big deal. 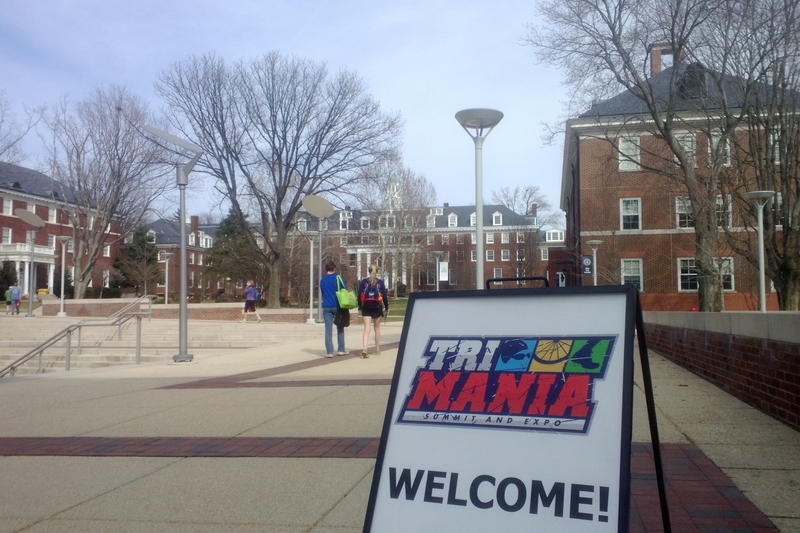 A great example is the TRI-Mania Summit and Expo, a massive event focusing on triathlon and nothing but triathlon: gear sales, clinics, races, lectures, even a panel discussion on the future of triathlon. All this sounded somewhat overwhelming to me, but as so often, curiosity bet introversion. The event took place at the Georgetown Preparatory School in Strathmore, Maryland. I had not bothered to find out in too much detail where I was heading. Instead, I had just checked the location roughly on a map, hopped on a train with my bike, and thought I would figure out the rest while biking from the train station. Finding my way turned out not to be a problem, but I can tell I was quite astonished when I found myself on the grounds of an all-boys Jesuit boarding school founded in 1789! 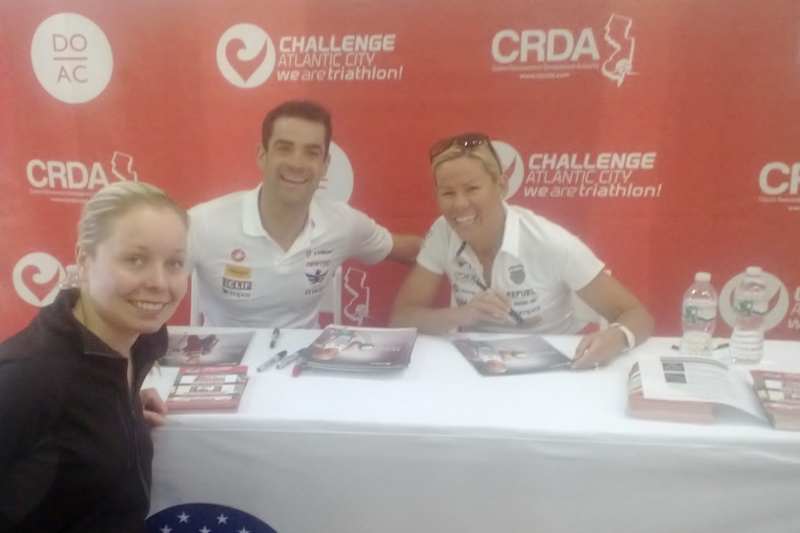 I made it to the expo just in time to sneak in the seminar audience for the keynote, a Q&A with 2 X Ironman World Champion Mirinda “Rinny” Carfrae and Ironman Champion Tim O’Donnell, who also happen to be married to each other and are hence known as the “triathlon’s fastest couple”. The athletes answered questions related to their careers, training, futures plans, even childhood. Nothing extraordinary, but it was fun to listen as both seem to have a great sense of humor. After the keynote, I wandered around the expo for a moment, ate some free candy, and managed to stay strong and not buy anything. I was already on my way out when I saw people standing in line. I got curious and then found out that they were waiting for autographs from the Ironman Champions. I am pretty sure I haven’t asked for an autograph from anyone since the late 90s when I was a teenager and a huge fan of Finnish snowboarders. Then again, I was not in a hurry, so I joined the crowd. Already while waiting in the line, I met a triathlon celebrity: Tom Knoll who was one of the 12 finishers of the very first Ironman in 1978. He was on the expo promoting his book Where It All Began. 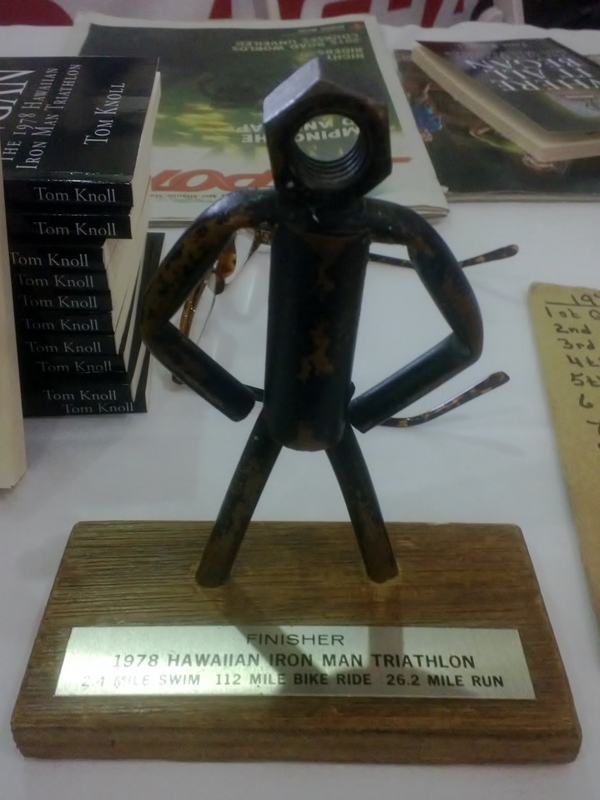 He had brought his original Ironman trophy with him: literally an iron man. Finally it was my turn to meet Carfrae and O’Donnell. In the end, asking for an autograph and chatting with them was not that intimidating… But I did surprise even myself by saying things like “this is like meeting Obama, but better”. Well, at least I made them laugh. 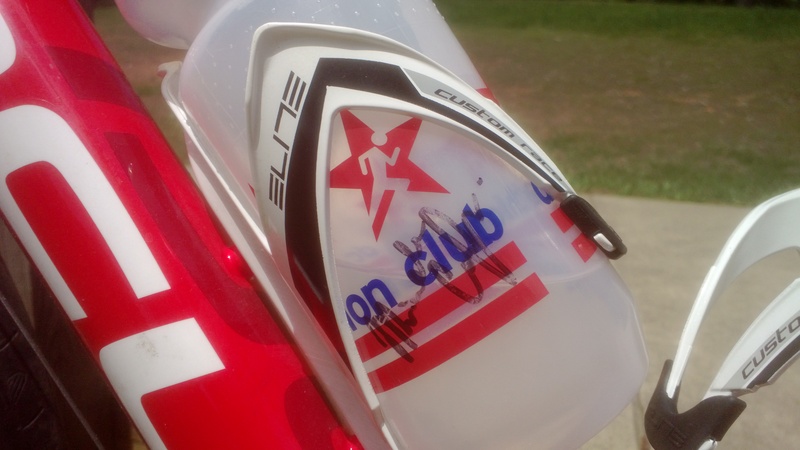 And now I have a lucky water bottle signed by the triathlon’s fastest couple. 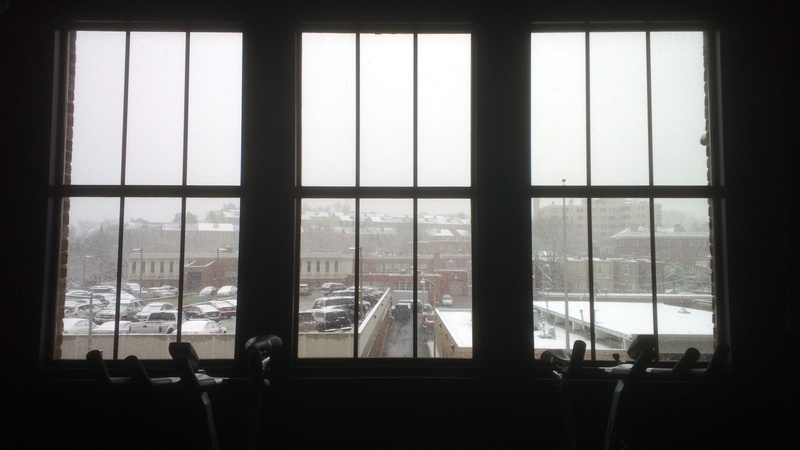 Like I wrote after returning from Hawaii, if Ironspectating does not maximize your training motivation, nothing does. This event was a perfect extra boost. 100 days to go to Musselman Half Triathlon! Although living in DC is notoriously expensive, experiencing fun things for free is actually very easy. For example, the entry to all the Smithsonian museums is free. Still I had only visited one Smithsonian in November before I made it to the National Portrait Gallery. A guided tour (free, naturally) led by a volunteer was a great way to get an overview of the vast collection and learn a few funny anecdotes of U.S. presidents. 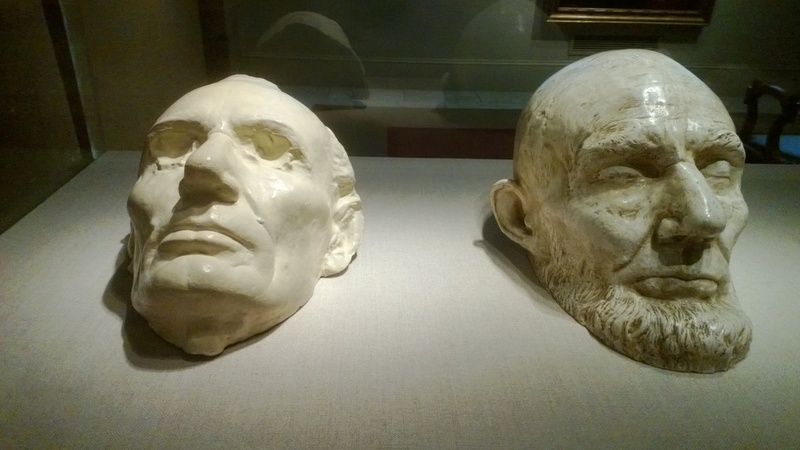 The most memorable part of the visit were the life masks of Abraham Lincoln from 1860 and 1865. I certainly hope that my five years with Nokia did not take as great a toll on my health as the Civil War took on Lincoln’s. 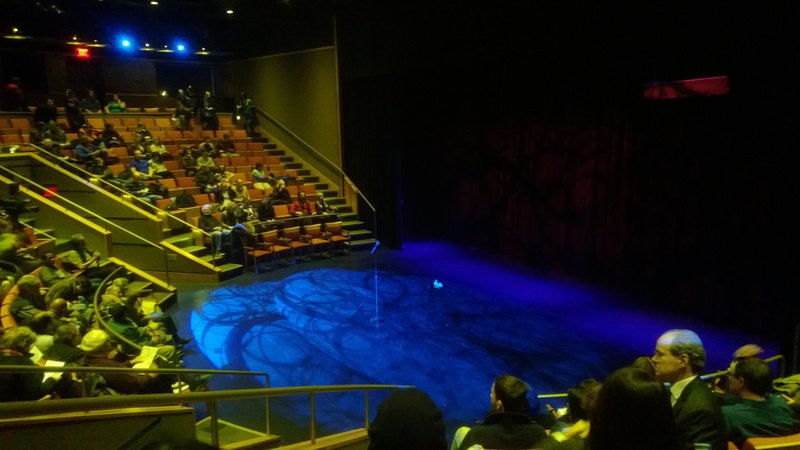 Other fun free things in February included free cupcakes and cookies at the AIA gift store, an “ahh-some” free yoga class, a free visit to a luxury gym, swimming for free, and danah boyd‘s book launch event. My birthday was in October, but I got to relive it in February when my sister was visiting DC. As a birthday present, my parents had authorized her to take me to a nice dinner. Accompanied with one of my foodie friends, we indeed had an excellent dinner at the table in Shaw. 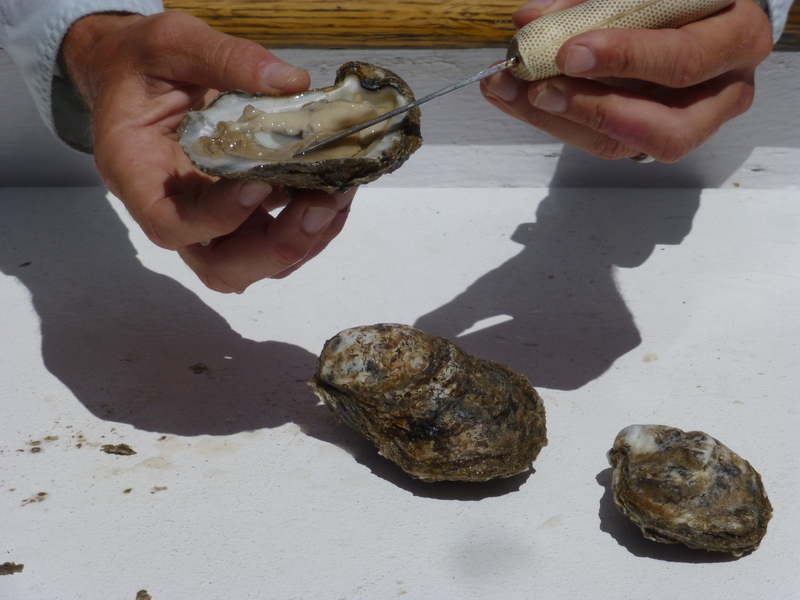 The 4-course tasting menu consisted of oysters dressed creatively (e.g. 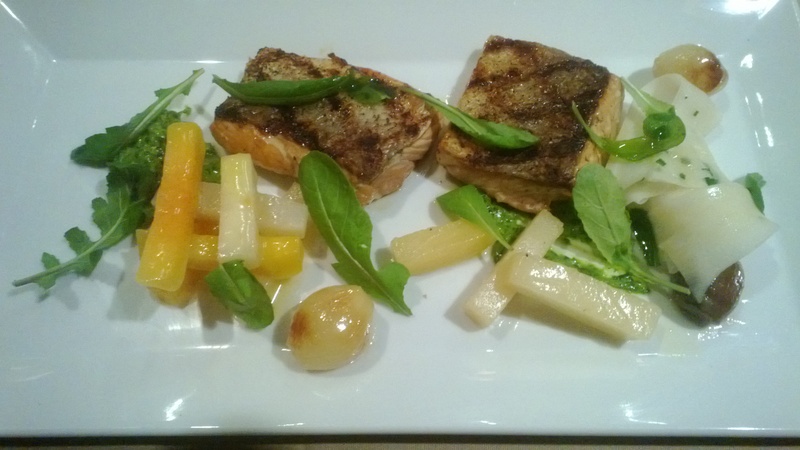 with grapefruit), beet carpaccio, trout, and a passion fruit dessert. So good! After the dinner we headed to a neighboring bar, A&D, to celebrate my sister’s name day. That was actually in December, and my present to her was to take her out for a drink in DC. I was not the only one whose birthday was celebrated in DC in February. February 5th was the 210th birthday of J.L. Runeberg, the national poet of Finland. Why would we celebrate that? Some might say because Runeberg wrote the lyrics of our national anthem. 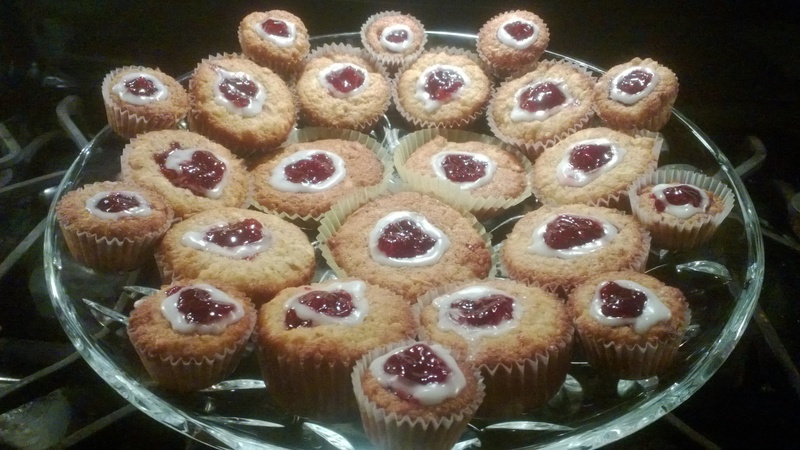 Most Finns would admit, though, that the real reason why Finns still celebrate his birthday every year are Runeberg’s tarts. The poet had a sweet tooth. Once when the family was out of anything sweet, Runeberg’s wife Fredrika had to invent a pastry, the prototype of a tart that according to the legend the poet enjoyed for breakfast every day since then. I made a batch of Runeberg’s tarts for our Super Bowl Party, and as they were a big hit, another batch for the Red Cross colleagues. 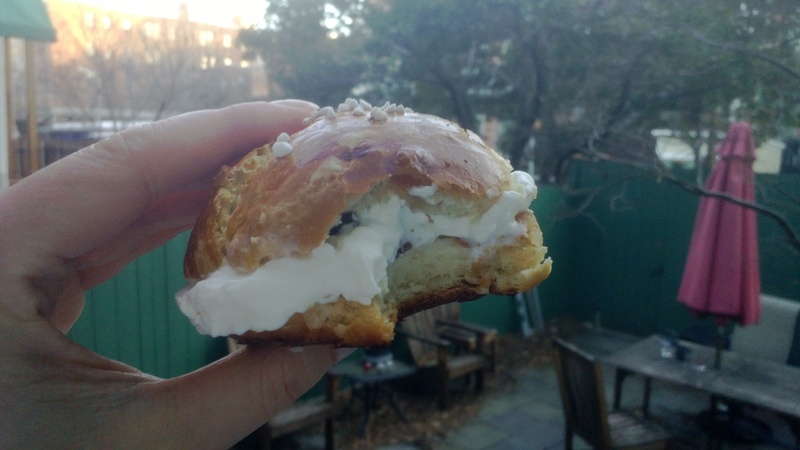 In the end of the month, there was still time for another traditional Finnish baking project: Shrove buns. These buns are a premium version of the most typical Finnish pastry. They are filled with whipped cream and either almond paste or strawberry jam. The debate of which one is the correct filling is most likely never-ending. I opted for strawberry jam this time, for very pragmatic reasons: that was easier to find in the grocery store. A funny detail is that most of the buns had been eaten by the time I realized that Shrove Tuesday was actually only at the beginning of March this year, so I was accidentally a week early. One of the things that I missed from Helsinki during the beginning of the year was the brilliant documentary film festival DocPoint. Hence I was more than happy when I heard of the DC Independent Film Festival. The festival started with a feature-length documentary film Partners for Peace. The documentary follows a group of American and Canadian women on a trip to Israel and Palestine on a mission to learn about the decades-long conflict and to support local female peace activists. Among the audience were several members of the delegation, including writer and activist Jaclyn Friedman and Nobel Peace Prize recipient Jody Williams. They shared their thoughts, experiences, and frustration after the screening. I’m pretty sure this was the first time that I went to see a movie with a Nobel Laureate! The second movie that I saw during the festival was 3 Mile Limit directed by Craig Newland from New Zealand. New Zealand Embassy sponsored the event by catering the audience with kiwi delicacies, such as savory pies and Moa beer. The film is based on an unbelievable true story of a young guy who is a huge fan of rock music and starts a pirate radio station to break the New Zealand Government’s monopoly on broadcasting in 1960s. After the film, the audience had an opportunity to ask questions from the director over a Skype connection. 3 Mile Limit was chosen as the best international film of the festival.